One of our biggest Balkan itinerary tips is to never skip Serbia! And if you’re planning to come to Serbia, then you have to give yourself some time to explore Belgrade, Serbia’s hip capital. Whether you’re looking for recommendations for just a day or two, or you plan to spend some significant time in the city, here is our list of things to do in Belgrade to help plan your trip. This is a giant list, and we don’t expect you to run around and try to do everything on it while you’re in the city! We’ve researched and done these things over four separate trips to the city, and together we’ve spent almost two months here. We want this to be a comprehensive resource that everyone can use – from first-time visitors to even native Belgradians! Instead, we want to offer you a comprehensive list of what we’ve done and enjoyed. Some are activities that everyone does when here (see the Hotel Moskva, for example), while others are things that are slightly more obscure, like visiting the Western City Gate. However, if you go through this list, you should get a good idea of what Belgrade has to offer and you can pick the items that interest you. Belgrade is spread across two rivers, with multiple neighborhoods providing good options for accommodations. Here are our recommendations for where to stay in Belgrade. Generally, budget means hostel beds for around $10 a night and singles/doubles for around $30, mid-range is from about $40-100 per night, and luxury will cost over $100 per night. However, note that availability, time of year, and how much in advance you book will play a role in how much accommodations cost in Belgrade. Budget: If you want a cozy feeling hostel, Hostel Home Sweet Home in the Savamala neighborhood of Belgrade is a fantastic choice. Its central location close to Knez Mihailova Street and other Belgrade must-sees makes staying here ultra-convenient. It’s sunny and open, with options for dorm rooms as well as affordable single and double rooms for travelers who want a little more privacy without paying a fortune. It’s one of the best-rated options in town, so we recommend you check out availability and book in advance here. Another popular choice is Balkan Soul Hostel, located in Stari Grad and a convenient walk from all the hot spots like Kalemegdan Park, Belgrade Fortress, and the splavovi on the Sava River. Every bed has its own charging area and lights, which are essential to me when picking a hostel. It has a social atmosphere and friendly staff who can make your stay in Belgrade even more charming. Check out availability and reviews here. If you want a more traditional accommodation option, we recommend the affordable four-star Zepter Hotel on Terazije, one of our favorite streets in all of Belgrade. It has all the amenities you’d expect from a 4-star hotel, like a gym room, in-room coffee machine, and a fantastic daily breakfast. Rooms sell out often, so check out availability and book in advance. Belgrade is full of beautiful churches and religious buildings. 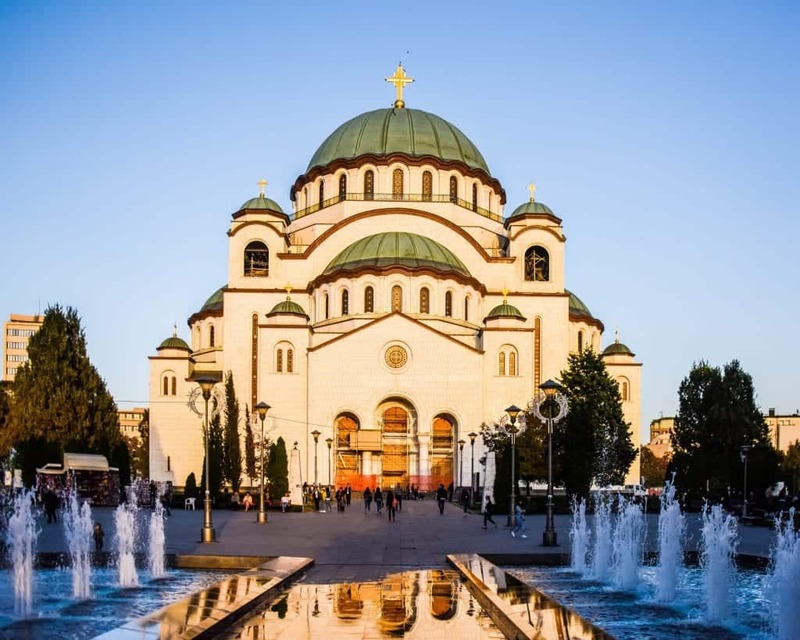 Whether you’re the type of traveler who loves to tour inside or you simply want to get a glimpse of the beautiful architecture as you walk through the city, here are the most important churches and religious sites in Belgrade. Like most countries in the Balkans, Serbia was once part of the Ottoman Empire. While other countries in the Balkans such as Albania and Bosnia & Herzegovina have maintained more of their Ottoman roots, preserving mosques and adapting to the religion, Serbia has largely erased most traces of its Ottoman rule. 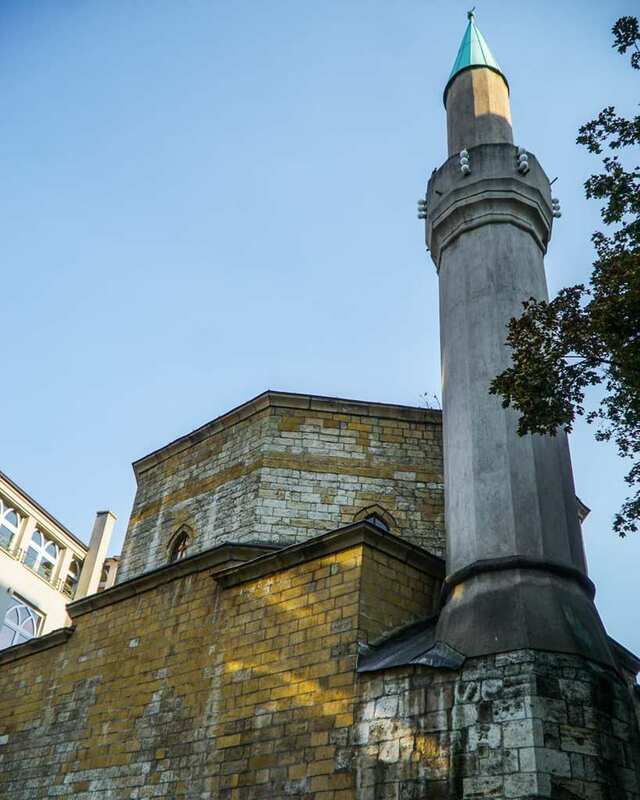 The only exception in the city of Belgrade is the Bajrakli Mosque, located on Gospodar Jevremova Street in the now hipster-capital of Dorćol. The mosque dates back to 1575, and it is the only remaining mosque from Ottoman times when there were nearly 300 mosques in the city. While the mosque is beautiful and historically important, it’s quite hard to capture as it’s bookended on both sides by other buildings, making photos nearly impossible. Belgrade’s synagogue isn’t anywhere near as grand or as beautiful as Novi Sad’s or Subotica’s, but if you’re interested in learning a bit about Belgrade’s Jewish history it is worthwhile to track down the synagogue as it is located just a few blocks away from Kalemegdan and Knez Mihailova Street. Originally done in a Moorish Revival style similar to Sofia’s synagogue, the building was largely destroyed in bombings in 1941. You can see the inside on a Jewish history tour, which are run by Go2 Serbia, for 15 euros. This charming yellow Orthodox is best viewed from the top of Gardoš Tower, where it’s bright yellow paint and silver domes are unmistakable. If you take a minute to visit the church yeard, you’ll find Zemun’s cemetery, with burials covering over a hundred and fifty years. In one plot, you can see family members who were both in the 18th century buried next to their great-great-great grandsons and daughters. Unfortunately, the church is currently closed for reconstruction, but you can appreciate the history and the architecture regardless, especially from above. Translated from Serbian as the Temple of Saint Sava, this Orthodox Cathedral is one of the main symbols of the city. It is the largest Orthodox church in the Balkans, and one of the largest in the world. The planning for this temple began in the nineteenth century, with building commencing at the beginning of the twentieth. However, the Balkan Wars and World War I forced the construction process to cease. Work began again in the thirties, but the bombing of Belgrade during World War II forced the construction to stop again. Both the Nazis and the Soviet Armies used the construction site as parking lots, Construction did not start again until 1985, but the NATO bombing of Serbia in 1999 again caused the project to be put into question. The dome was only completed in 2017, over a hundred years after the initial construction began. The church is a testament to the Serbian people’s resilience in the face of war caused by both foreign invasion and their own government’s failings. 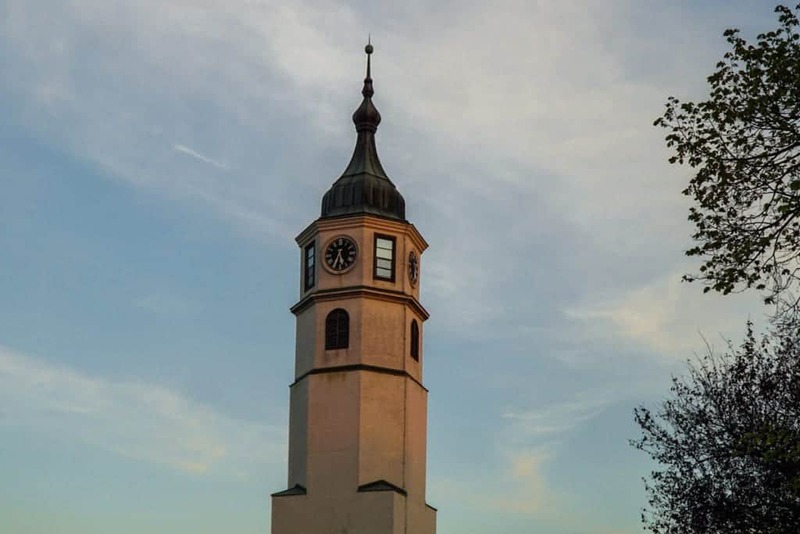 This beautiful Serbian Orthodox Church is located within the Belgrade Fortress, but many people miss Ružica Church, not knowing to look out for it. 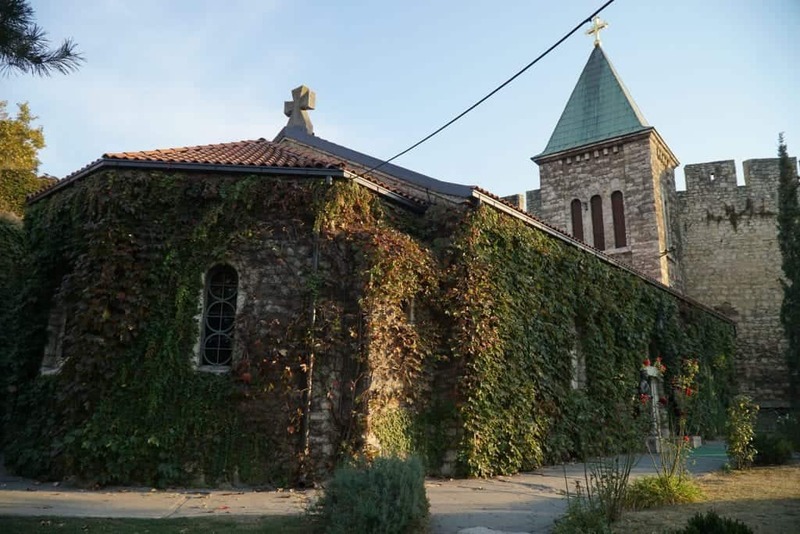 This ivy-covered stone church is a replacement of a church in the same spot that was destroyed in 1521 by the invading Ottomans. It was later rebuilt and used as a gunpowder magazine and as a military church, before being damaged again in World War I. It had its final renovation in 1925. While fighting alongside England and the US, Serbian soldiers on the front line used their downtime to craft the incredible chandeliers from the materials available to them: the spent shells and weaponry that lay strewn around the battlefield. The soldiers managed to carry their light giving creations to the church, where they still light the room to this day. Right next to Ružica Church, you’ll find the quiet yet beautiful St. Petka’s Church with beautiful views of the confluence of the Sava and Danube Rivers. This church is still very much in use and on a visit on a random weekday I saw several young Serbians visiting the church. The church has traditional icons with gold plating on both the interior and exterior of the church. I thought the courtyard was particularly beautiful, with roses and stone walls that match the fortress surroundings. Since it’s right in the fortress and literally a 2-minute walk from Ružica Church, this is a can’t-miss in Belgrade. 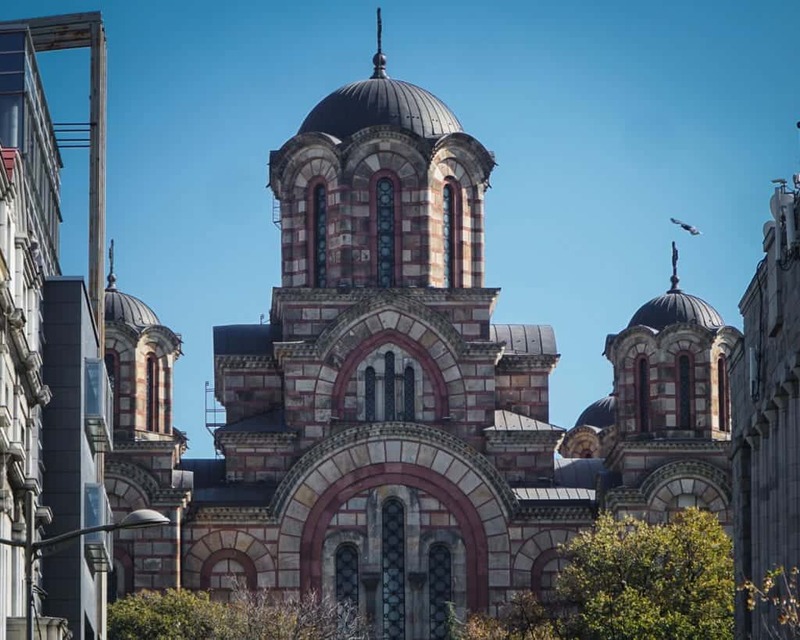 Done in a Serbo-Byzantine style, St. Mark’s Church is one of the points of pride of Belgrade. 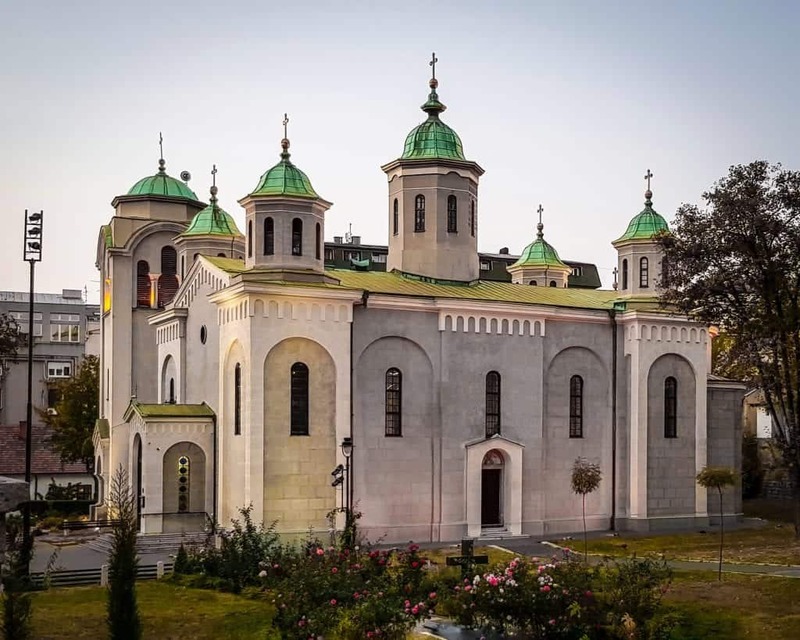 Located right near the gorgeous Tašmajdan Park, St. Mark’s Church was built in 1940, and until St. Sava was constructed it was the largest church in Belgrade. Inside, you’ll find the typical Orthodox frescos and iconostasis. The St. Mark’s Church (Crkva Svetog Marka in Serbian) is done in the style of Gračanica, a UNESCO-listed Serbian Orthodox monastery located in Kosovo. It can fit over 2,000 worshippers, and while it’s definitely worth seeing, it’s a little bit out of the way for most tourists so you will likely only be visiting alongside locals. Known by locals as simply “the Cathedral,” this Serbian Orthodox Cathedral was built in the first half of the nineteenth century and is one of the most important religious sites in the country. It’s located near Kalemegdan Park and its distinctive clocktower can be seen from many points within Belgrade Fortress. Although this part of Belgrade was never controlled by the Austro-Hungarian Empire, this church looks remarkably like those in Zemun and Vojvodina, particularly its ornate clocktower that is out of place with the Orthodox interior. 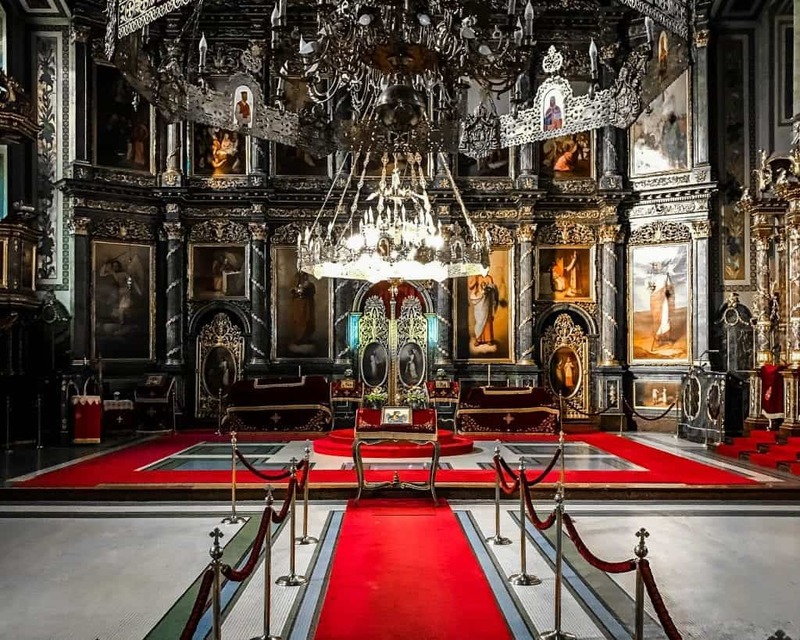 Inside, the altarpiece and interior artwork are more reminiscent of western European Catholic Churches than Orthodox ones, though there are still some indicators that this is an Orthodox cathedral, such as having no pews for worshippers to sit in. Likewise, the tower outside is done in the Neoclassical style more common in the Hapsburg empire than in the Ottoman-controlled portion of the Balkans. If you hear the bells at the Vaznesenjska Church (the Church of the Ascension), then you’re hearing a slice of history. It was these same bells that were used in 1830 to declare that the Ottoman Empire was granting autonomy to Serbia. Think of these as Serbia’s answer to the Liberty Bell. 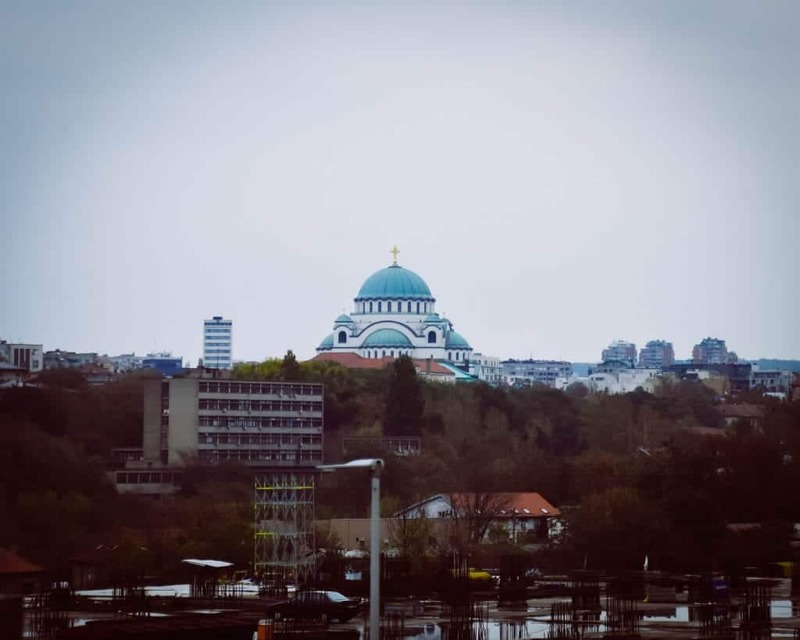 We nearly missed seeing Vaznesenjska Church, but luckily the Belgrade Tourism Center told us that its a site not to miss! Located near Beograđanka and the Ruins of the Yugoslav Army Headquarters, make sure to see this beauty when you’re nearby. If you’re coming to Serbia from North America or Western Europe, you’ll probably be thrilled by the prices you find in Serbia. Take the opportunity while here to enjoy all the forms of shopping that Belgrade has to offer. There’s everything from designer and luxury stores to farmer’s markets to flea markets. If you want to know what to buy, take a look at our guide to the best Serbian souvenirs. 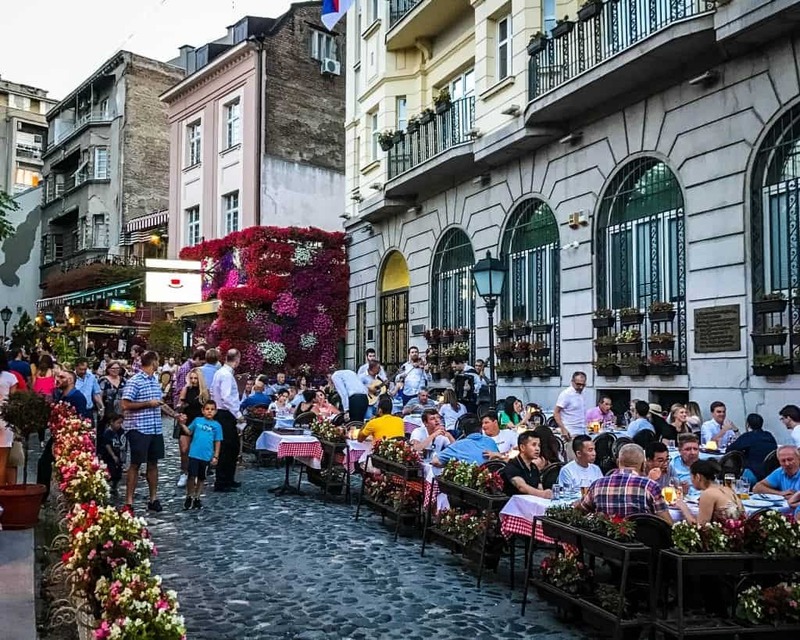 One of the busiest pedestrian ways in the city, Knez Mihailova is lined with shops, street art, and places to relax and enjoy the buzz of the city. No visit to Belgrade is complete without popping into one or more of the stores here or simply walking along and people watching. This is also a great place to pick up a Serbian sim card if you haven’t grabbed one yet. Knez Mihailova roughly stretches from Palace Albanija / Hotel Moskva all the way down to Kalemegdan Park, so you can see several important sights in the city on your way down this famous stretch of Belgrade. Skadarska Street is the heart of Skadarlija, a small ‘bohemian’ neighborhood in the center of Serbia. On Skadarska Street you will find a ton of cute restaurants and kafanas, all photogenic and tourist-friendly. In case you’re wondering what a kafana is, it is loosely translated as ‘coffee house,’ but really they are something more than that. 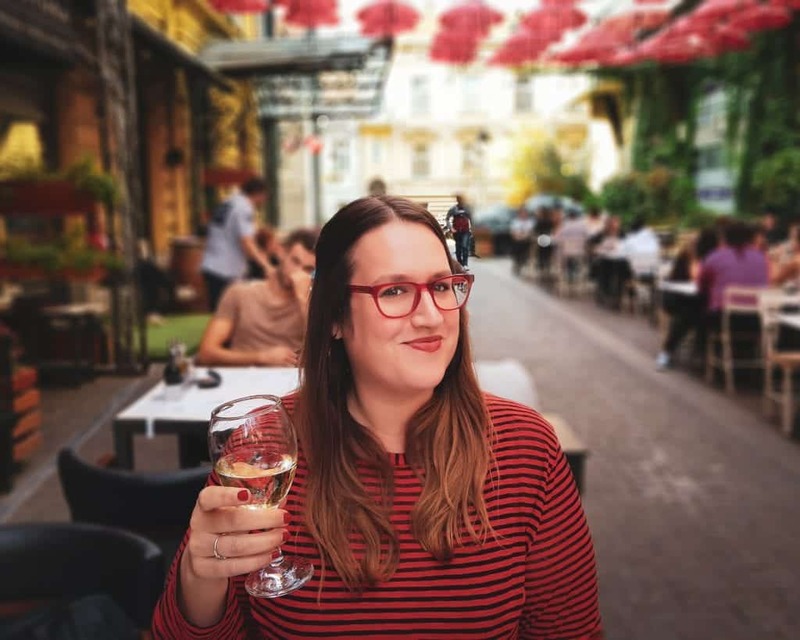 Hanging out at a kafana is a Belgrade must – they are the heart of Serbian social life, the place where people go to catch up over a cup of coffee or a beer (and maybe some light snacks). 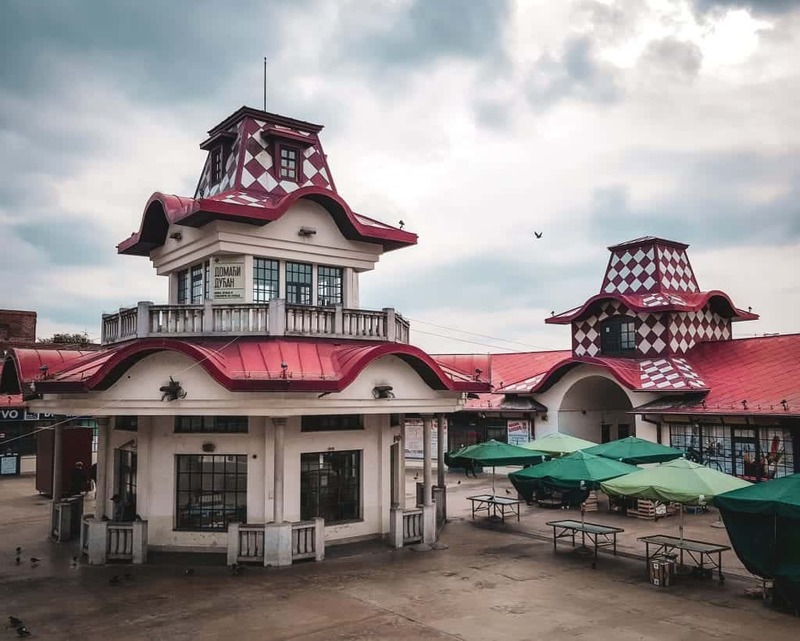 This is a great neighborhood to stop for lunch as it’s quite central and home to some high-quality Serbian restaurants (our top pick on Skadarskais Dva Jelena), and it’s also fun at night. 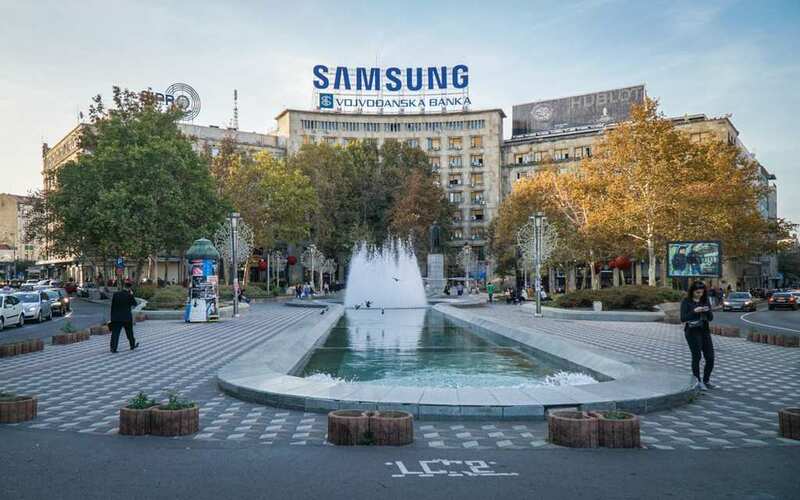 Roughly where Knez Mihailova ends, Terazije Boulevard continues, connecting many of Belgrade’s important sights and representing much of the iconic architecture of the city. Terasije starts around Hotel Moskva and continues upwards throughout the city. Zeleni Venac translates as “Green Wreath” and was named after a long-gone kafana in the neighborhood. The open-air market has endured, however, celebrating its 170th-anniversary last year in 2017. This is a great place to buy edible Serbian souvenirs like ajvar, fresh cheeses, produce, and rakija. It’s also a great place to indulge in some street photography. 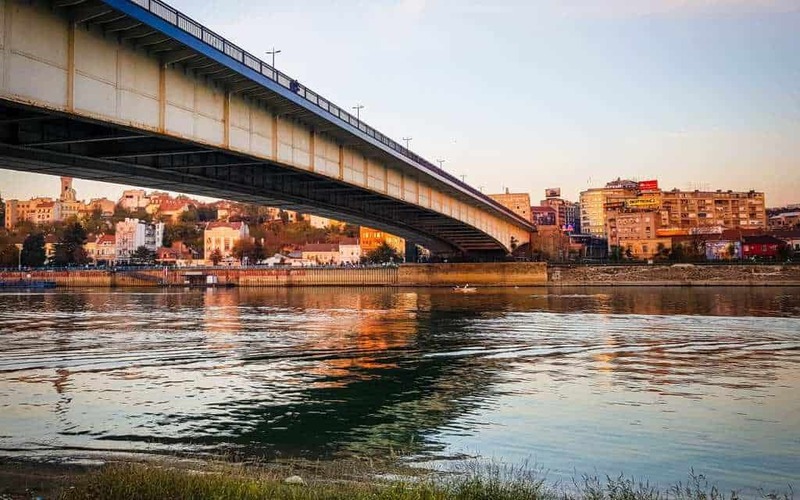 Because of the way Belgrade is built over the area where the Sava and Danube rivers converge, the city is full of important landmarks and bridges that you’ll notice from many different vantage points. A walking tour of Belgrade is a must, but we also recommend you look for some of these landmarks whenever you cross a river or get a new view of the city. This is one of the first landmarks a visitor sees when arriving in the city by car (or bus), and it’s an impressive view for anyone reaching Belgrade after a long journey. This cable bridge spans the Sava river and connects Novi Beograd (New Belgrade) with Čukarica. A relatively recent addition to the city’s skyline, the Ada Bridge was completed in 2012 and is a symbol of the new post-Yugoslav Serbia. It’s named for the island Ada Ciganlija, which supports the bridge since the middle pylon sits on the island’s tip. Who doesn’t love a good tv tower? They make great places to sightsee, along with symbolizing a city’s dedication to the changing technology that arrived in the twentieth century. Places like Kopitoto in Sofia and Istanbul’s Endem Tower are national treasures, and Belgrade’s Avala Tower is no exception. Avala Tower is considered by many to be one of the most beautiful TV towers in the world, and it’s the largest tower in the Balkans at205 meters tall (672 ft). Famously bombed during the NATO bombing campaign, it was rebuilt starting in 2006 and opened its doors to visitors in 2010. Its a popular site for tourists, receiving nearly 200,000 visitors annually. it’s located a bit outside of central Belgrade (though still technically within the city limits), about a 30-minute drive away. We opted not to visit it due to time constraints, but fans of 20th-century history and Communist architecture won’t want to give it a miss. The Belgrade Cooperative Bank was created in 1882 when the Karađorđe dynasty came into power and brought sweeping change to Serbia. It ceased functioning as a bank in 1944 in WWII, two years before communism came to Serbia, and never regained its original function. Still, it was renovated several times despite the disuse, and there are plans to revive it further as part of the ambitious Belgrade Waterfront development project. To this day, it is named one of the most beautiful buildings in Belgrade and one of the best feats of Serbian architecture, becoming a cultural monument in 1966. Belgrade Fortress is connected with the city center by Kalemegdan Park and gives the fortress an air of public space rather than museum space. 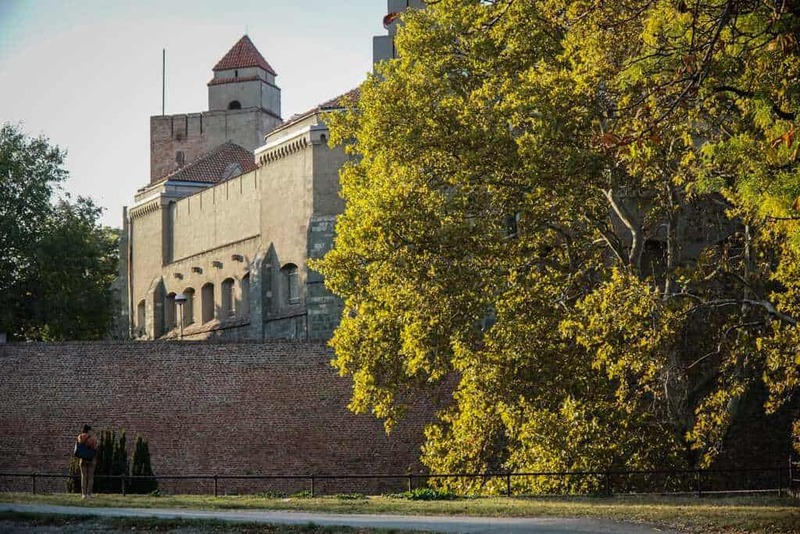 In fact, there is no entry charge to visit Belgrade Fortress – you can simply stroll right in, right from the main pedestrian street of Knez Mihailova. 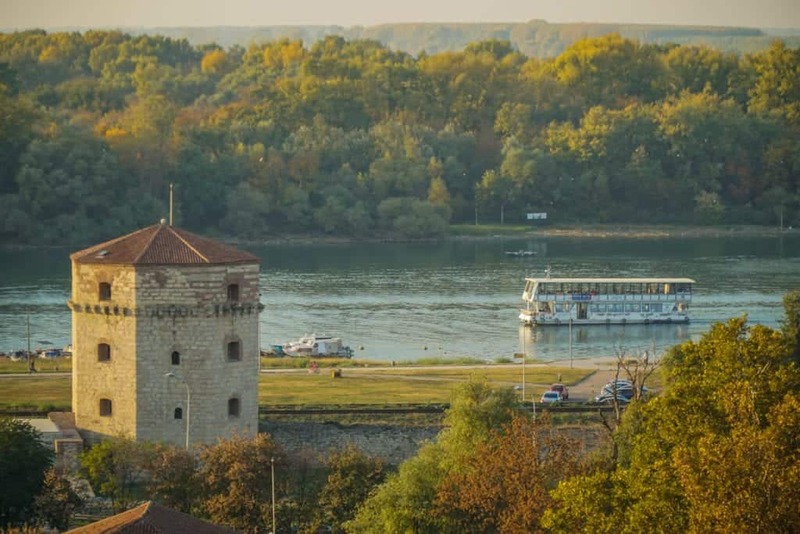 There are several important points within Belgrade Fortress, including Ružica Church, an astronomical observatory tower, the Victor monument, and the Gratitude to France Monument. While its official name might be Belgrade Palace, Beograđanka doesn’t have the appearance of a palace at all. 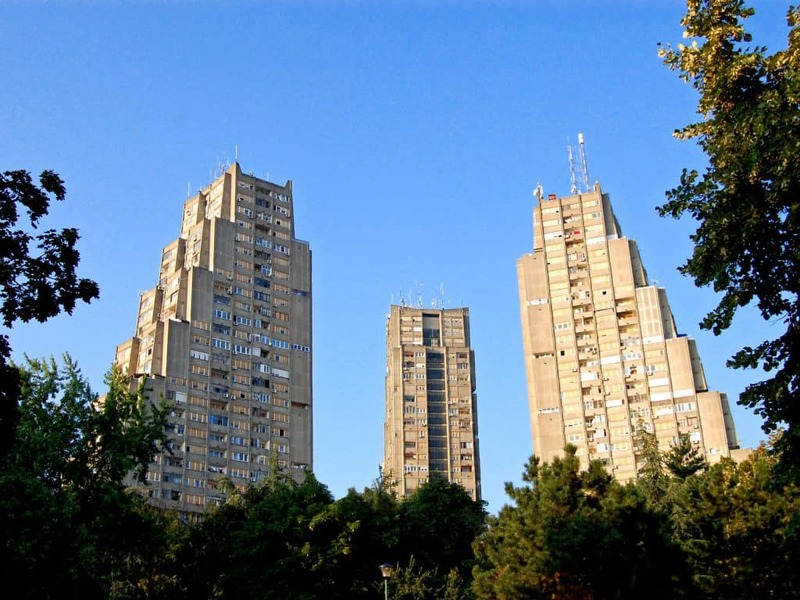 Rather its a modern high-rise built in the 1970s and is one of the symbols of Belgrade’s prosperity in the middle of the twentieth century. 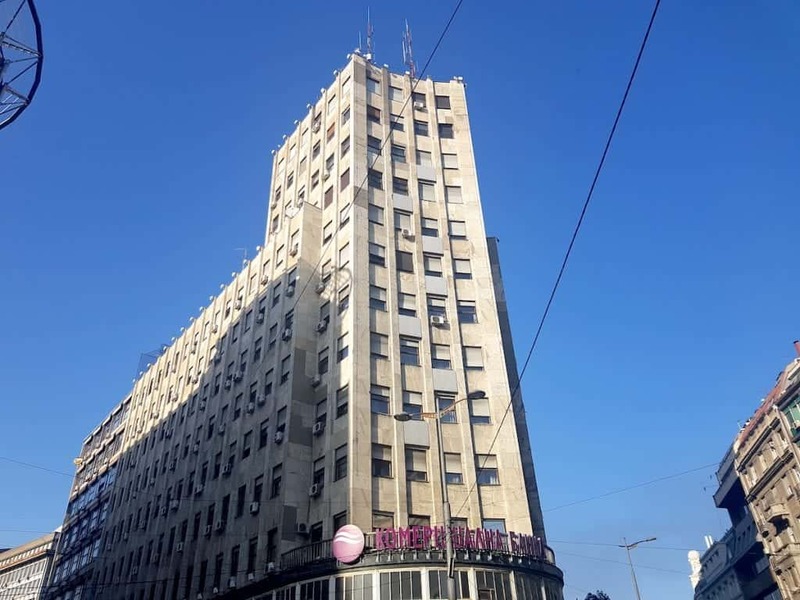 There’s not much for a tourist to do at the Belgrade Palace except for shop since the restaurant at the top has been closed since the 1990s and the rest of the building is mainly devoted to offices. 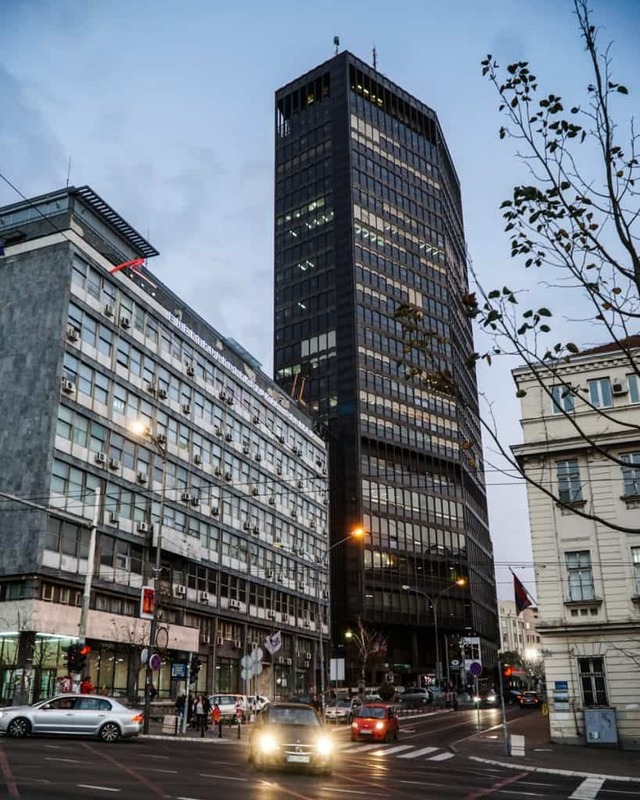 However, when walking through the city, if you notice this oddly shaped skyscraper, pause for a moment and picture what Belgrade would have been like fifty years ago when this building symbolized the bright future Belgrade predicted for itself before the turmoil of the 1990s. An extension of Brankova street, this bridge crosses the Sava river and connects the center of Old Belgrade with New Belgrade. During the communist era, this was officially named the “Brotherhood and Unity Bridge,” but locals never truly adopted the name and it was dropped after the dissolution of Yugoslavia. The pedestrian lanes were closed for several years for repairs but reopened in 2018. Crossing Branko’s Bridge is a great way to get some great views of the city from the river, and there’s a river path to walk on both sides. In a city full of impressive architecture, Captain Miša’s mansion stands out. 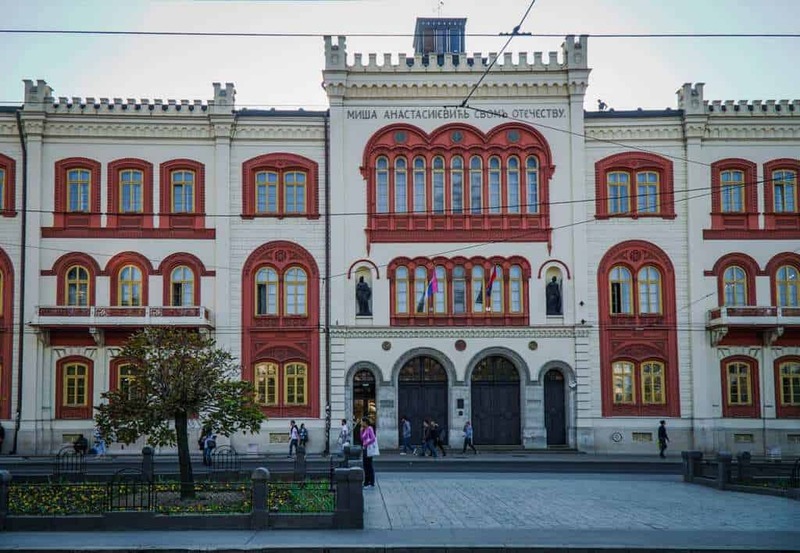 Built in 1863, the building was originally intended to be a gift to Captain Miša’s son-in-law, but was given as a gift to “his mother country for educational purposes”. It then became home to the Belgrade Higher School. Now, it is home to the headquarters of the University of Belgrade. 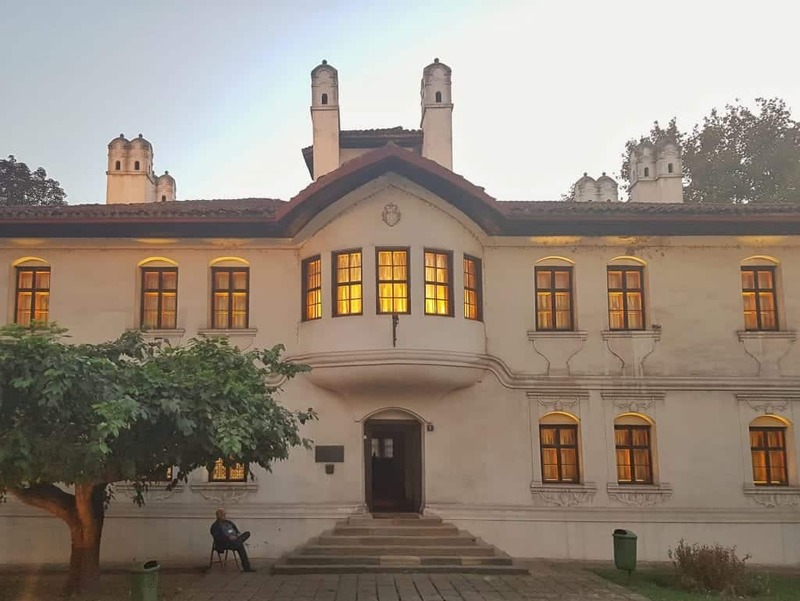 It has been a Monument of Culture of Exceptional Importance since 1979 and is widely considered to be one of the most beautiful buildings in Belgrade. 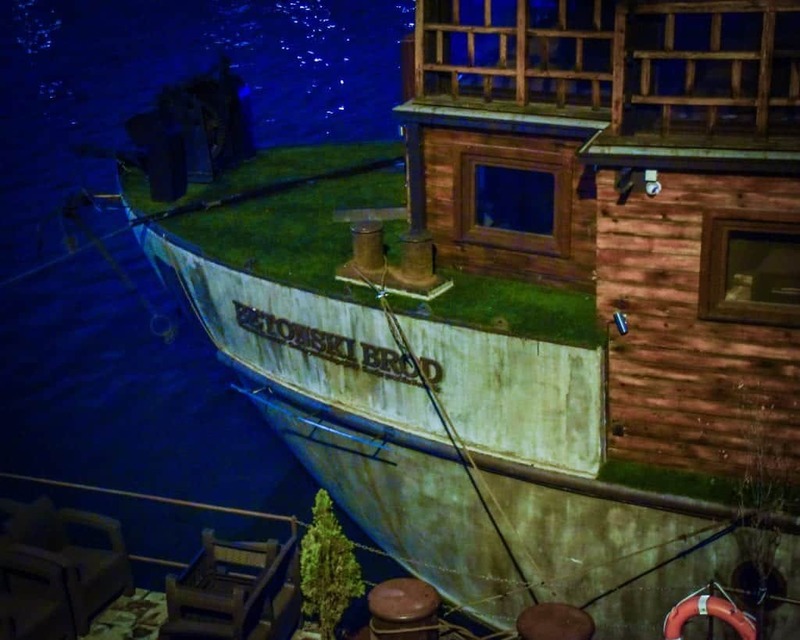 Have you ever wanted to eat dinner in an authentic Nazi Ship made out of concrete? Well in Belgrade, you actually can. The Betonski Brod was a German World War II ship constructed out of concrete so that it wouldn’t trigger Allied mines. It was discovered in Belgrade and restored. It is now a restaurant and cultural center open in the summer. Unfortunately, we weren’t able to eat there since it wasn’t open in October, but we will try it on our next trip to Belgrade. Note that the location on Google maps is incorrect. Google has its location as being nearly under Branko’s bridge, but it is actually further down under the Belgrade Fortress. There’s a giant silver statue nearby as well. If you get to where Google tells you to go and you can’t find it, walk along the river towards the fortress for about seven hundred meters. 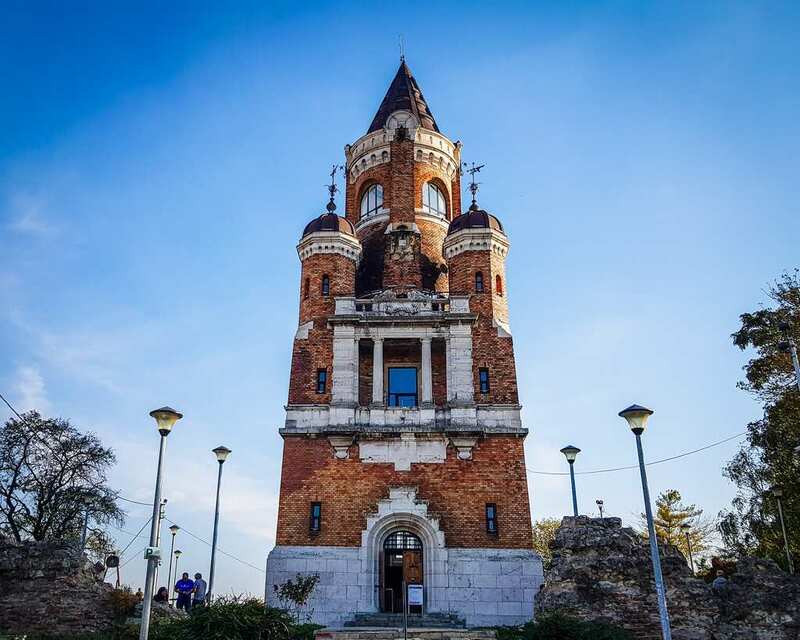 Built atop previous ancient Roman and Ottoman fortresses, the Hapsburg Empire constructed Gardoš Tower (Serbian: Кула на Гардошу) or Millennium Tower, (Serbian: Миленијумска кула) in 1896 to celebrate one thousand years of controlling the area. Interestingly, this is the same exact development project that brought Budapest its Fisherman’s Bastion and Vajdahunyad Castle, as the Zemun part of Belgrade actually used to be part of the Austro-Hungarian empire. 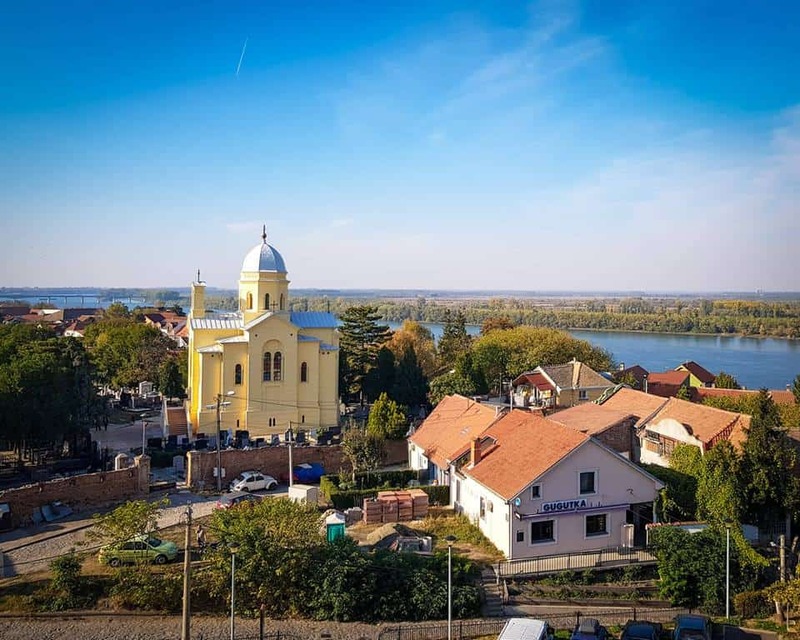 This is why while Zemun is now a suburb of Belgrade, it looks so different and distinct from the rest of Belgrade – it was historically part of a different empire, not just a different city! Gardoš tower is constructed in the Gothic style. The climb to the top is a quick sixty-four stairs, and you’ll be rewarded when you get there with stunning city views without the crowds. One of the oldest hotels in the city, it was completed in 1912 and is considered one of the best examples of Vienna Secession architecture in the former Yugoslavia. During the period before World War I, the Hotel Bristol was the center of society and fashion in the capital. While today it’s lost its glamor, its remarkable to think how important this building was to the city a century ago. 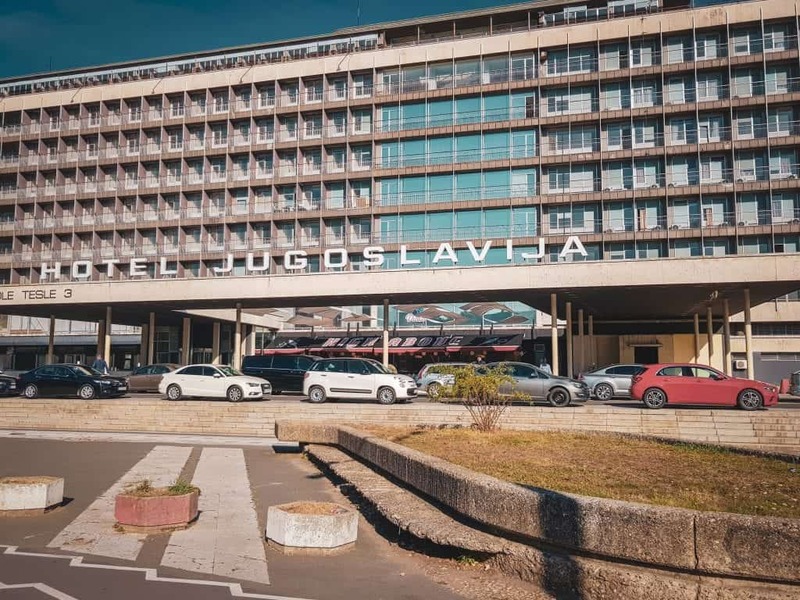 Once the most famous and glamorous hotel in Yugoslavia, former guests include Queen Elizabeth II, Presidents Richard Nixon and Jimmy Carter, and astronaut Neil Armstrong. 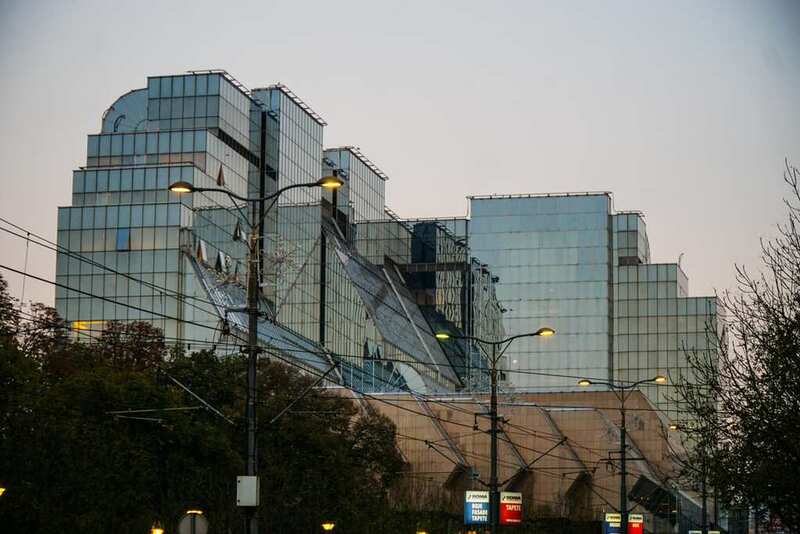 During the 1999 NATO bombing of Belgrade, part of the hotel was damaged when it was hit by two bombs. Abandoned for a time, the hotel is now reopened. Come here to see this famous example of brutalist architecture! Situated on Terazije Square, this is one of the most famous buildings in the city. The history of the building dates back to 1908 and is one of the oldest hotels currently operating in Serbia. 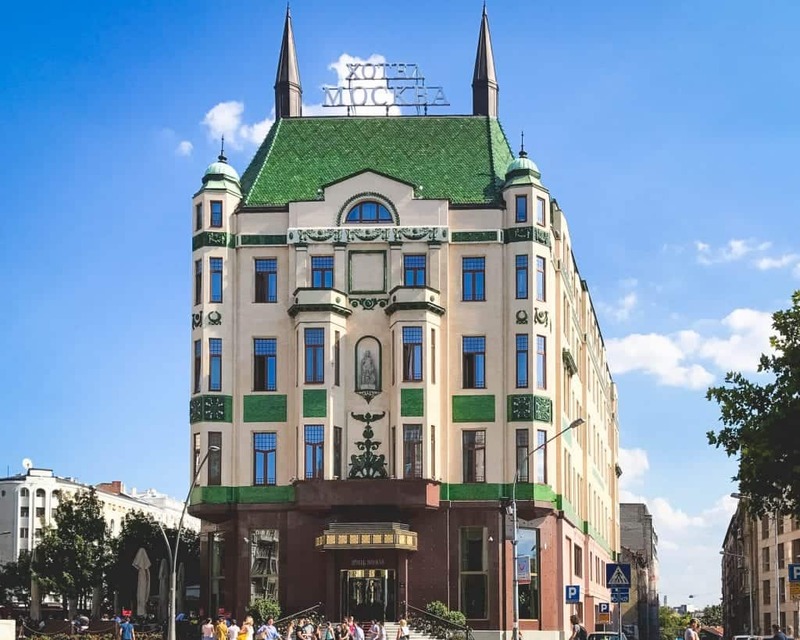 Originally, Hotel Moskva was called Velika Srbija and was a mere 36 room inn within the massive Palace Rossiya, a Russian palace built in the early 1900s. It later expanded to take over the whole palace. 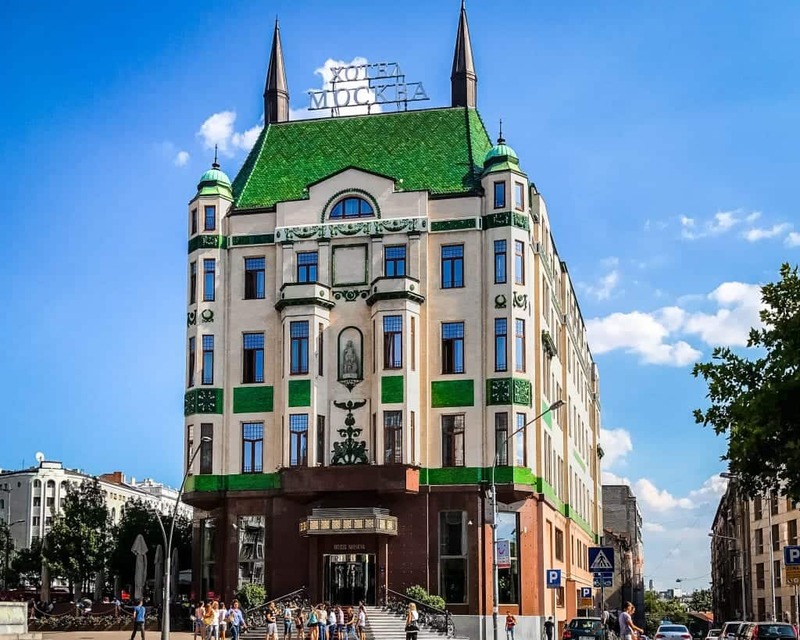 Hotel Moskva changed hands several times – from the Russian Empire to the Bank of Yugoslavia to the Gestapo during the Nazi occupation, before being nationalized during communism and then later re-privatized in 2005. As one of the meeting points for the cultural and political elite over the last century, Hotel Moskva’s had no shortage of important guests, including Leon Trotsky, Albert Einstein, Robert De Niro, Alfred Hitchcock, Indira Gandhi, Louis Armstrong, and countless others. You can see photos of all its famous visitors displayed in a hallway at the hotel; just ask if you’re curious. 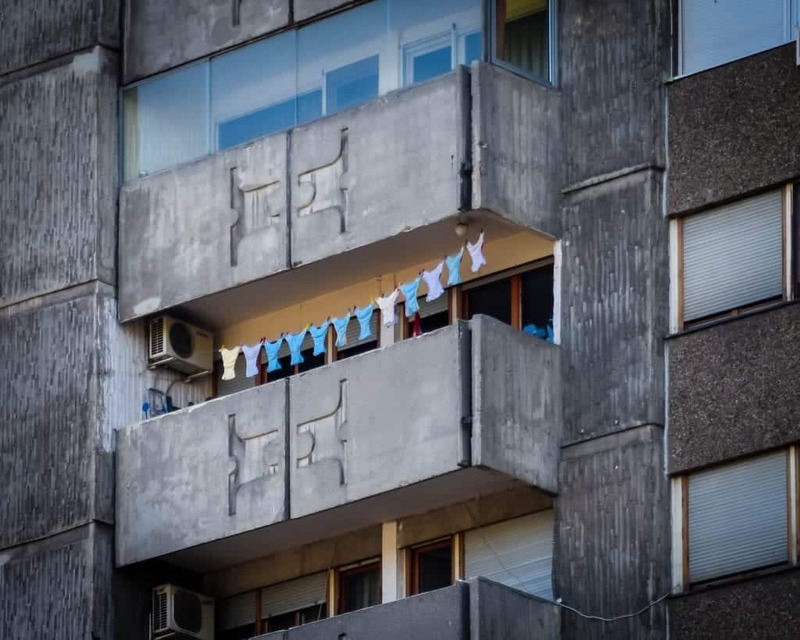 Many Serbians look back fondly on the days of Yugoslavia, where they enjoyed relative wealth and power compared to their present-day situation. In fact, a recent poll showed that some 80% of Serbians believe that the breakup of Yugoslavia was a bad thing for their country. With that in mind, it’s no wonder that so-called “Yugo-nostalgia” is a common phenomenon. 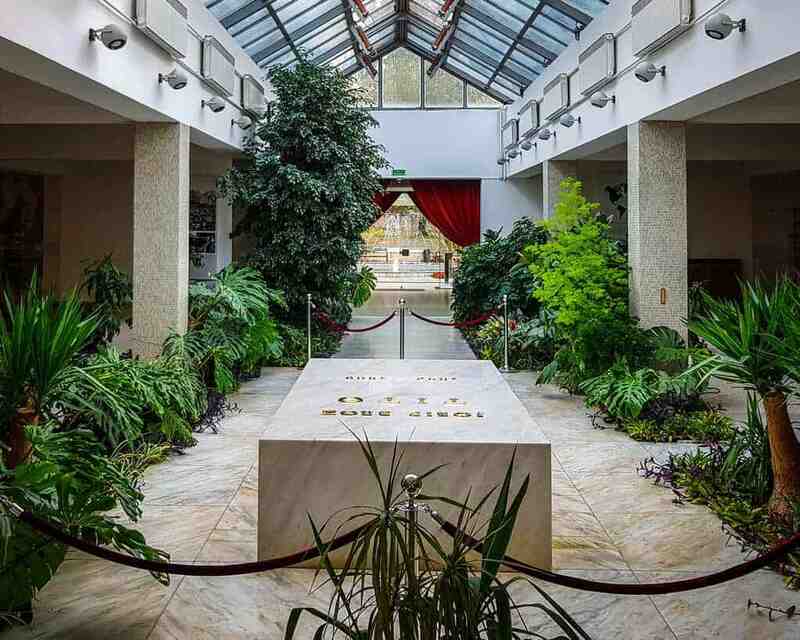 Josip Broz Tito, who ruled Yugoslavia for nearly 40 years, is widely regarded in a positive light in Serbia, and you can pay your respects to him at the House of Flowers, where he is buried. You can visit his mausoleum from 10 AM to 6 PM daily except on Mondays by purchasing a combined ticket with the Museum of Yugoslav History nearby, which cost 400 Serbian dinars ($4 USD). Near to the Church of St. Mark, Tašmajdan Park, and Nikola Pašić Square, the House of the National Assembly is the current seat of the legislature in Serbia. It was designed in 1901, but construction wouldn’t finish until 1936, interrupted first by the Balkan Wars, then World War I, then the Great Depression. While the name of the country has changed a handful of times, this has always been the seat of power in Belgrade. It’s a beautiful building and in between several important places. While I wouldn’t particularly go out of my way to visit it, it’s certainly worth stopping by if you are nearby. 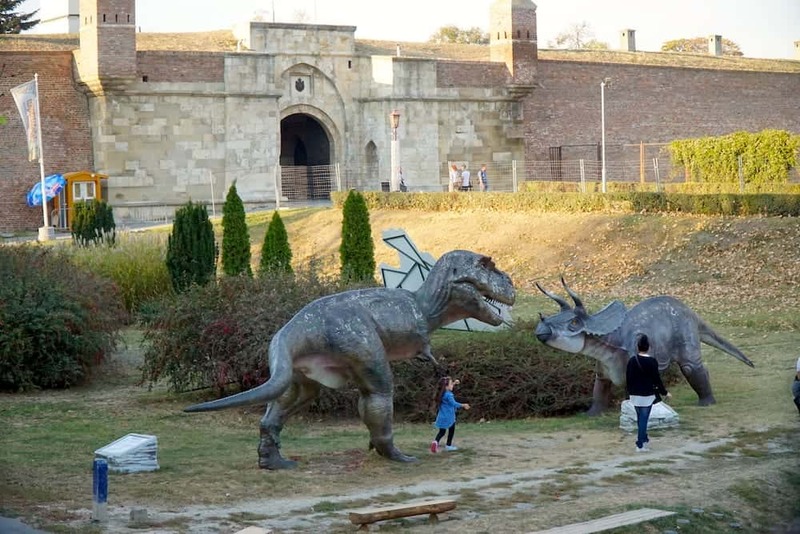 If you are traveling to Belgrade with kids and are looking for some kid-friendly things to do in Belgrade, make sure you stop by Jura Avantura, a kitschy dinosaur park in the middle of Belgrade Fortress. Kids can play with enormous, roaring dinosaur replicas while parents enjoy a break from entertaining them in the middle of a lovely park. I didn’t go inside as I’m childfree, but it’s hard not to notice when you’re in Belgrade Fortress! Admission is 350 dinars per person (about $3.50 USD). The National Bank Building is an oddly modernist building located near the beautiful Church of the Ascension and the ruins of the Yugoslav Army Headquarters, so it’s worth taking a peek at this architectural oddity when in Belgrade. The more beautiful (in my eyes, anyway) old building of the National Bank is located near Knez Mihailova Street, right nearby the red-umbrella’d street where the Serbian restaurant Manufaktura is located. While currently, its front-facing facade is under construction, you can still get a nice glimpse of Belgrade’s National Theatre on its sides. Built in 1868, the National Theater was brought to Belgrade after the success of the National Theater in Novi Sad (now Serbia, but formerly part of Austria-Hungary). The architecture is considered Renaissance style and was designed in a similar fashion to La Scala in Milan. Currently, drama, ballet, and opera companies all function out of the National Theater. Having actually taken a train out of the Old Belgrade Train Station (Belgrade Main Railway Station) just last years, it’s strange that this has been relegated to a historic building. But alas, the new Belgrade Centre Station has taken over, and trains no longer leave from this spot with the last train leaving at 9:40 pm on June 30, 2018, bound for Budapest. Even though this is no longer where you’ll head to get on a train for Zagreb or Sarajevo, it’s still worth a stop as the 19th-century building is designated a cultural monument of great importance and has the look and feel of one of the great railway stations of old Europe. Damaged by bombing from both the Nazis and the Allies, it was reconstructed after World War II, and it played an important role as the center of transportation in Yugoslavia. The building is being turned into a museum, but for now, you can still explore the building and appreciate the grand facade on your own. Belgrade has many bridges, but the history of the Old Sava bridge makes it worth noting, especially since it’s a great place to walk across to get photos of the Ada Bridge. The Old Sava Bridge is the green one crossing the Sava River. The bridge’s history is darker than you might suspect. It was built by the Nazis in 1942 after all the other bridges across the Sava were destroyed. When the Nazis retreated from Belgrade, they intended to demolish the bridge, but it was saved by a local man who risked his life to keep the bridge from being destroyed. Thus the bridge is one of the only places in Europe where you can walk across an actual Nazi bridge and celebrate that the locals were able to save the Nazis from destroying it as they left. This 1930s modernist building near Knez Mihailova was the first highrise in Belgrade. The building was damaged during World War II, and it was so important to the city that this is where the Serbian’s placed their flag to show that they were liberated from the Nazi’s. 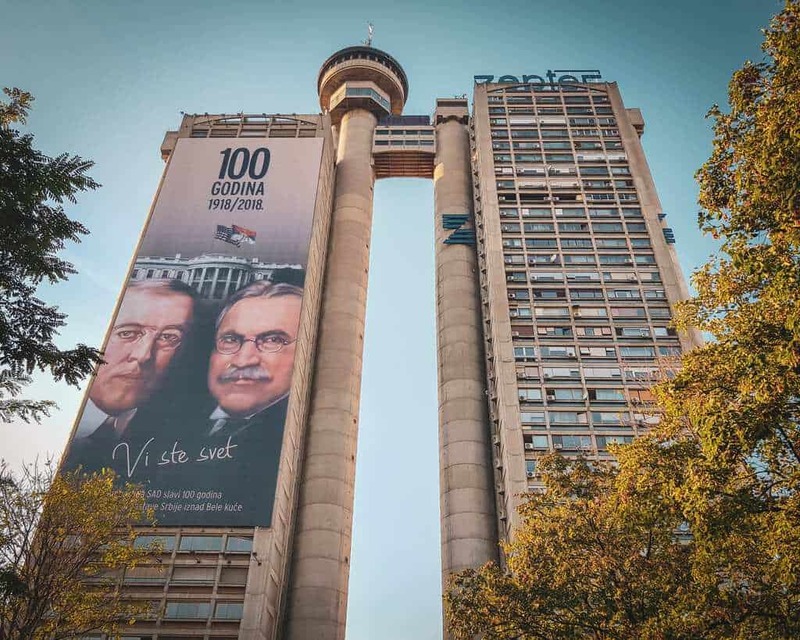 While you don’t need to go out of your way to visit, if you see this building while walking around Belgrade, stop to note that it was the tallest building in the city for many years as well as being the center for celebrations after the fall of the Nazis in Yugoslavia. Part of Belgrade Fortress, the Roman Well is actually a relatively new part of the city, as the “Roman” modifier is a bit of a misnomer. It was most likely actually built by Austrians in the 18th century, who wanted to claim inheritance over the Roman Empire. The “Roman Well” in Belgrade Fortress was never really used as a well because it failed to connect to a water source the way they wanted. Instead, it was converted into a dungeon – or more correctly, a hole where prisoners were thrown into and forgotten. 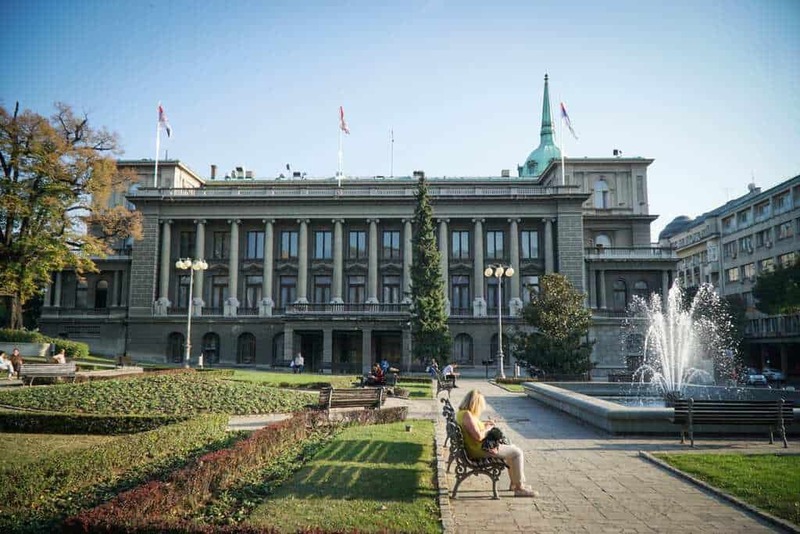 In reality, there actually are Roman wells in Belgrade, just not where you’d think – one is near the Russian Embassy in Vračar, another in Zvezdara, and another right downtown near Captain Miša’s Edifice in Studentski Park. 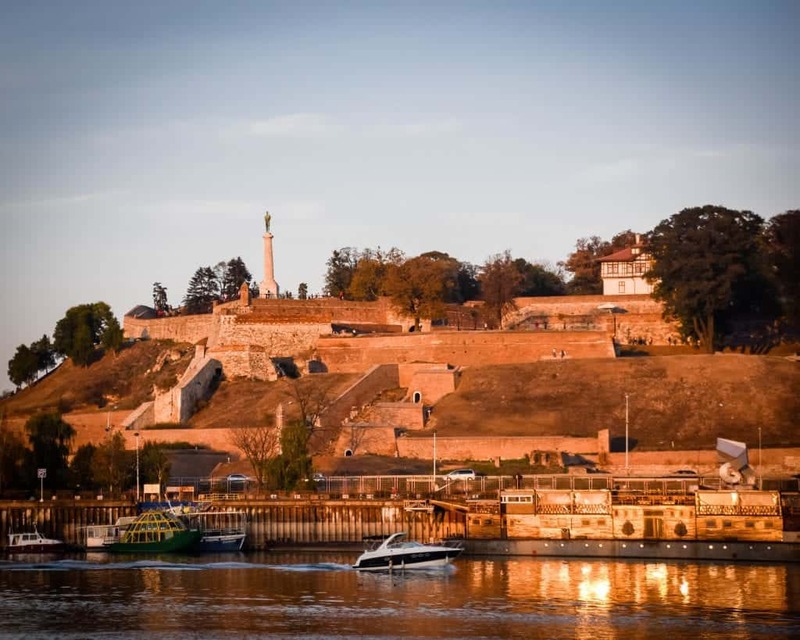 Since it’s part of Belgrade Fortress, you might as well give it a quick visit when you’re in the area! One of the landmarks of Yugoslav architecture in the city, this complex of three residential towers is commonly called the Eastern City Gate. This, paired with the Western City Gate (below) are two examples or residential complexes built in the brutalist style and are examples of major feats of architecture from the Yugoslav era. Due to poor maintenance, literal chunks of concrete began falling off the facades of the buildings in the 2010s. Residents are currently working to get funding for the necessary repairs. The ruins of the Yugoslav Army Headquarters can be found about a 10 minutes’ walk from the Central Train Station, in a central location in Belgrade. 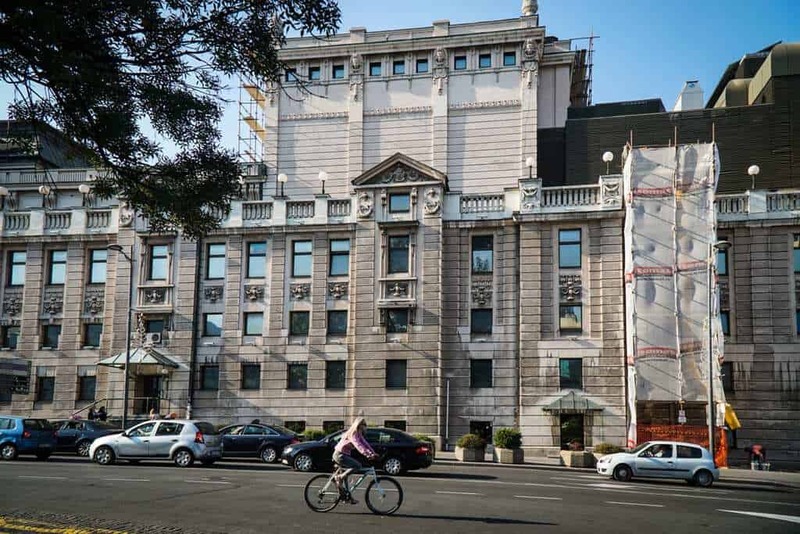 While much of the traces of the hardships of the 20th and 21st century have been erased from Belgrade, you cannot say the same for the former Army Headquarters building. NATO bombed this building several times for its symbolic importance rather than anything else, as it was no longer an operating command base. By the time the bombings ended, the building was too badly damaged to be repaired – and it has stayed this way since 1999 with no apparent plans to change it. In Belgrade Fortress, keep an eye out for this beautiful clock tower, built in the 18th century and still standing tall, despite fallen empires and brutal wars. It was originally started by the Austrians but was later finished by the Ottomans, and as such has a hybrid Turkish-Austrian style. You can enter and ascend a tiny staircase to the top for a small fee if you’d like a view over the fortress from within the fortress. While this isn’t something I’d necessarily go out of my way for, since you’ll likely be visiting the fortress, keep an eye out for it and remember its interesting history! If you want to see the train that Joseph Tito used to help keep Yugoslavia united, you can. However, its kind of an odyssey to get to it. We attempted to see it, but we didn’t have enough time to arrange the tickets. Contact the Belgrade tourism office in advance of your trip to make the arrangements. If you have some spare thousand dollar bills burning a hole in your pocket, you can also arrange to ride the train on a trip around Serbia. It seems like every city has a cool square or alley covered with Umbreallas. Belgrade’s is outside of the restaurant Manufaktura (below) and the umbrellas are all read. So wear something to match and snap a pic! You don’t have to eat at Manufaktura to pose, but we suggest you do since their food is amazing. Along with the Eastern City Gate (above), this is a brutalist high rise building dating from the communist era. Also known as the Genex tower, it’s actually two towers connected with a covered bridge and a restaurant at the top. The two towers are different heights, and the futuristic shape is distinct among the highrises in the area. This is still the second tallest building in Serbia after the Ušće Tower, and a brutalist masterpiece. While we love traveling Serbia solo, a great way to meet up with other travelers or locals is to go on a tour. They are a great way to dive deeper into one aspect of the city, along with being a great place to make friends while in Serbia. 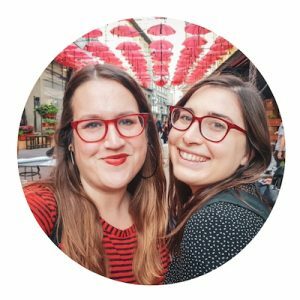 We’ve found Serbian tour guides to be some of the friendliest in the world, and we haven’t been on a tour in Serbia that we wouldn’t gladly recommend again. We love going on free city walking tours. We think the Free Sofia Tour in Sofia is amazing, and we are happy to report back that Belgrade has some amazing free walking tours as well! 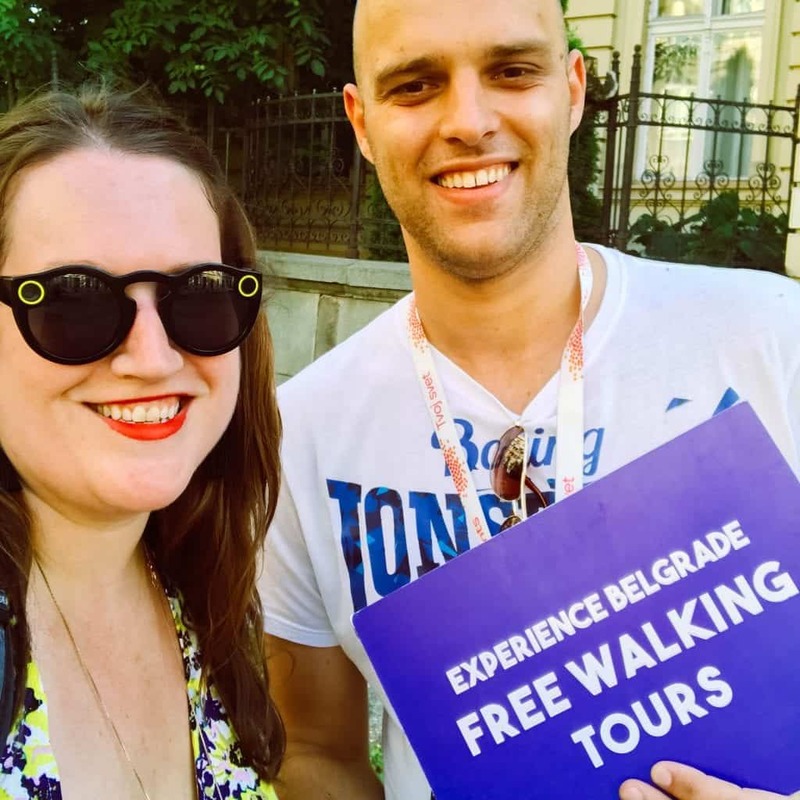 While the Experience Belgrade Walking tour isn’t the only free walking tour option here, we love how hard they work to ensure that Belgrade guests get the best first impression of the city. Tours leave from the fountain in front of the Hotel Moskva. You can check their Facebook page for seasonal times. Pro Tip: Remember that with any free tour, you want to tip your guide fairly, as that’s how they stay in business! We recommend tipping the equivalent of $5 (or more if you feel like it). One of the ways we most enjoy discovering a city is through our stomachs! 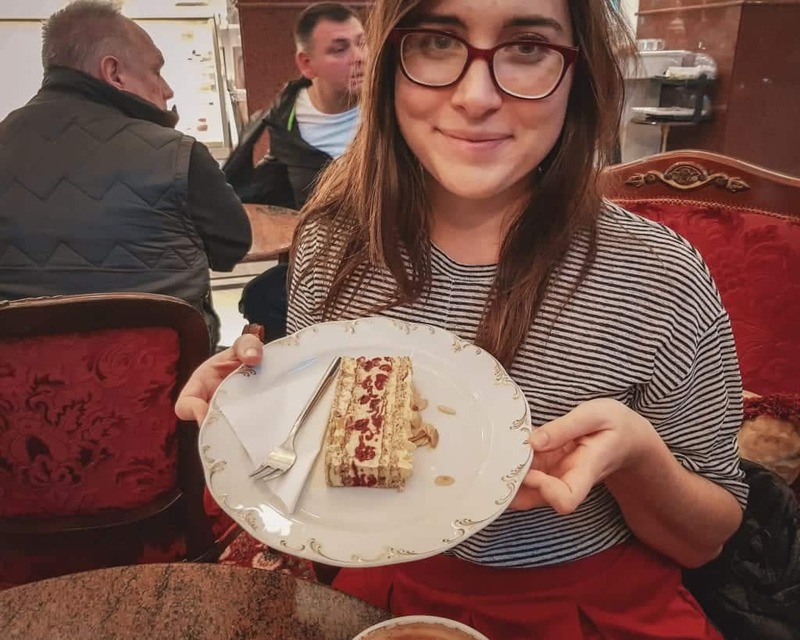 If you have limited time in Belgrade, or you simply want to dive deeper into Serbian culture, a food tour is an excellent way to taste your way through some of Serbia’s most famous and beloved foods. 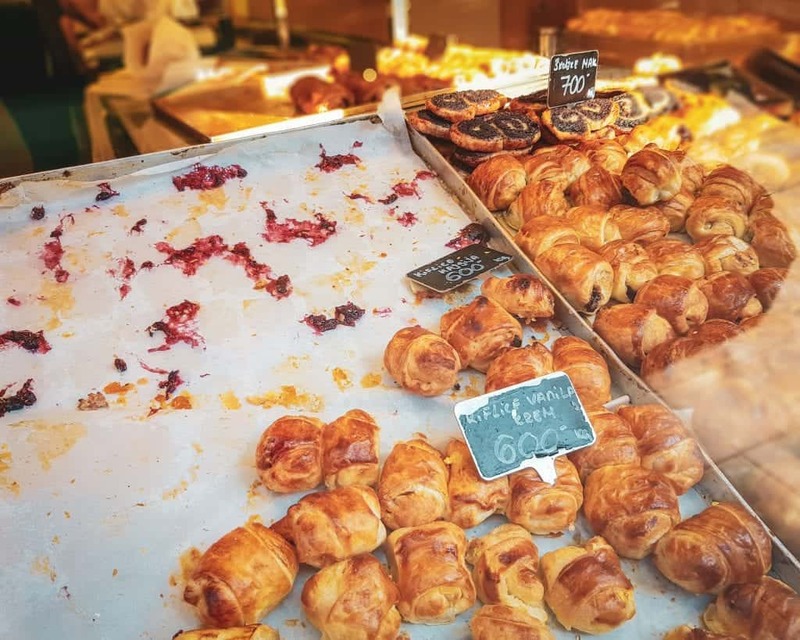 This food tour brings you to one of the oldest neighborhoods in Belgrade, Dorćol, and involves visiting a local pekara (bakery), a shop that specializes in pljeskavica (Serbia’s take on the hamburger), and some Serbian desserts. There is a minimum of two people to book, and it runs at noon daily. Check out availability here and book here. 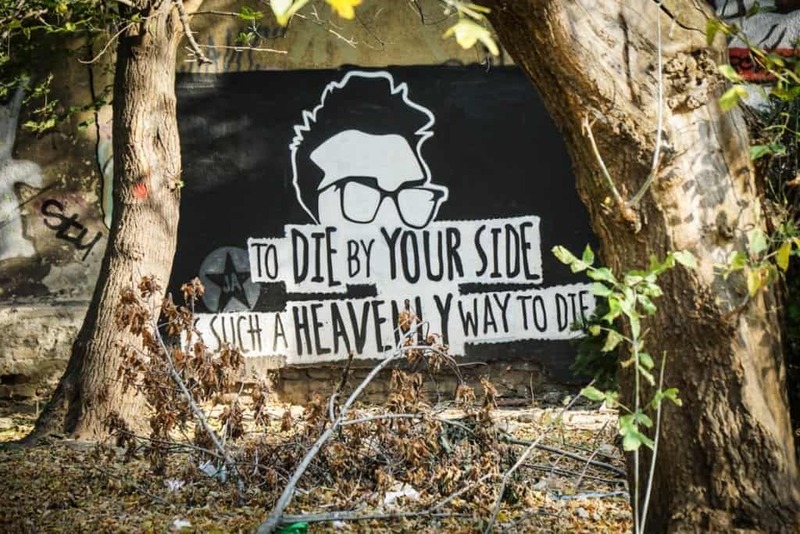 If you’re keen to explore the street art of Belgrade, it’s best to do so with a tour! 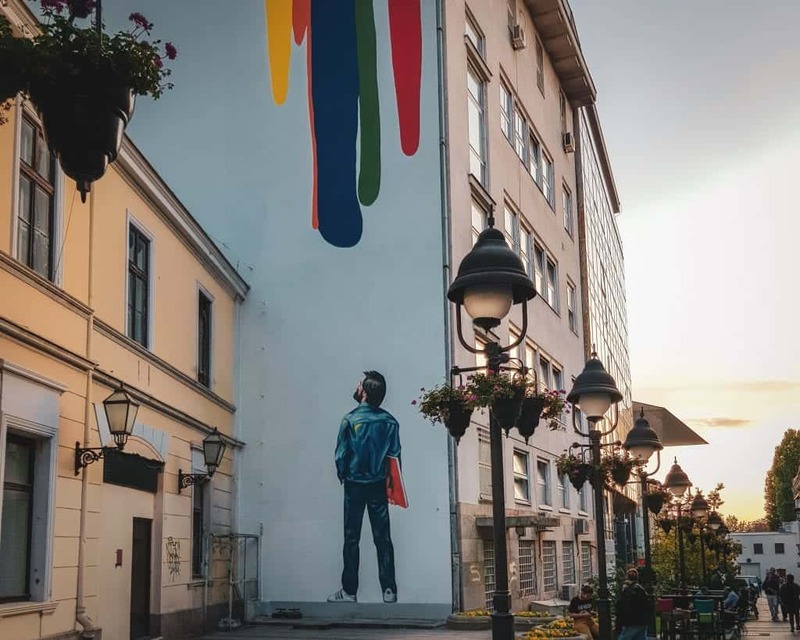 A lot of Belgrade’s best street art is a bit hidden from the tourists, so exploring on a guided street art tour is the best way to discover the local art scene. There are a few street art tours, but this alternative walking tour of Belgrade is free during the summer months. Be sure to tip! We recommend tipping at least 500 dinars ($5 USD) and more if you can afford it. This 3-hour Communism tour encompasses several important decades of Serbia’s recent history. Beginning in the heart of Belgrade in Republic Square, you’ll get an overview of Yugoslavia’s 50 years as one of the most successful experiments in Communism. You’ll learn about how Tito was seen in the past in present, and why many Serbians still look back fondly on the Yugoslavia years. 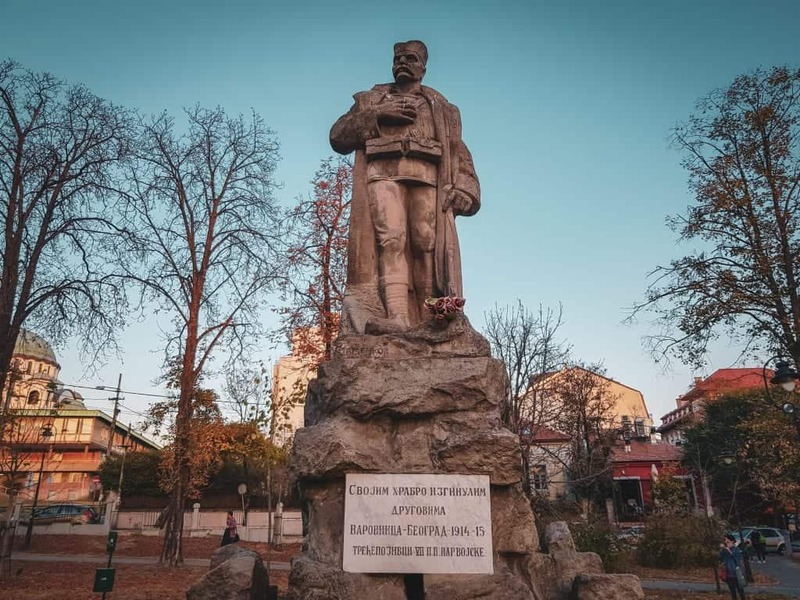 On this tour, you’ll see monuments that date back to the Kingdom of Yugoslavia, as well as the Serbian Parliament building where former president Slobodan Milošević was overthrown during the Bulldozer Revolution. Also on this tour, you’ll see the ruins of the Yugoslav Army Headquarters, which were destroyed in the 1999 NATO bombings, and learn about important events that took place there. 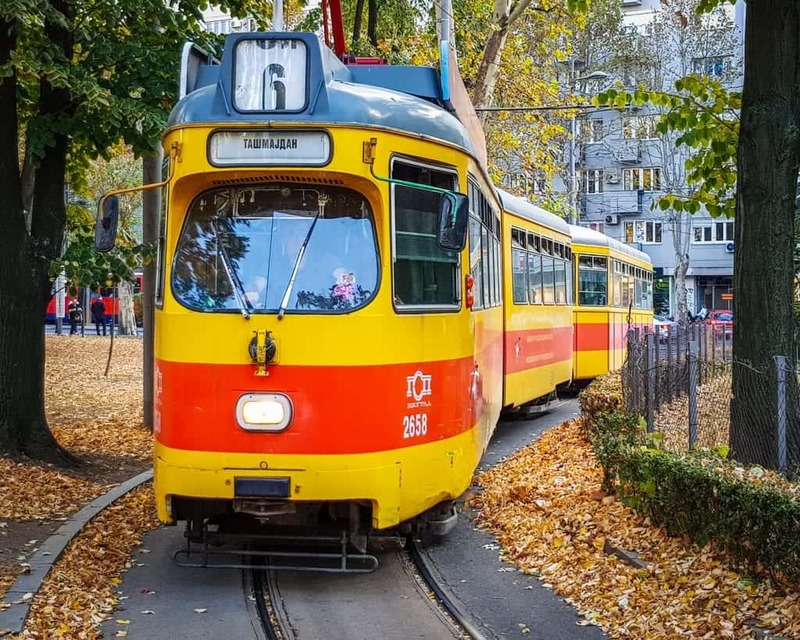 Finally, you’ll go by trolley to the elite suburb of Dedinje, with gorgeous city views and a quiter vibe, and visit the Yugoslav History Museum and Tito’s Mausoleum. As of now, tours run every day but Sunday and Monday, starting at 12 PM and ending around 3 PM. Check availability and pre-book here. What better way to get off the beaten path than to, well, go under it? 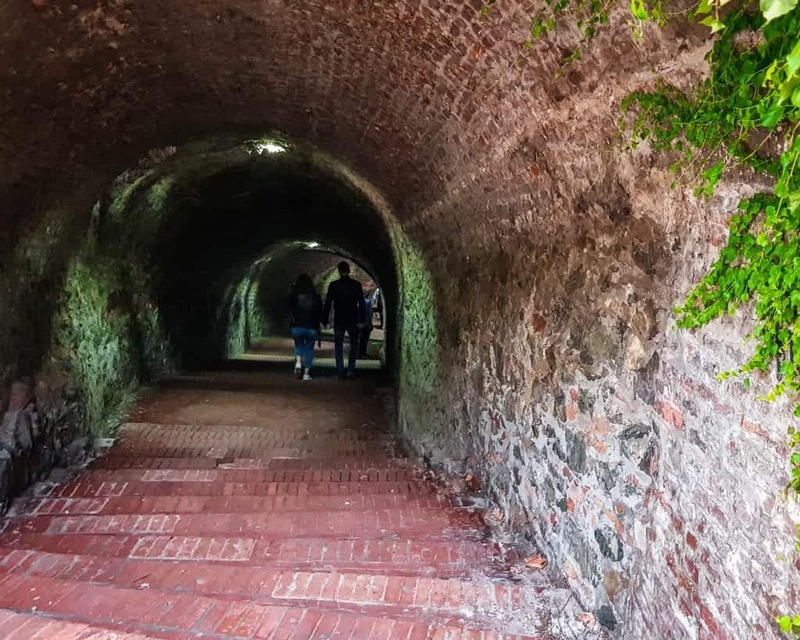 This underground tour of Belgrade covers several interesting sites in the Belgrade Fortress while educating you about the city’s darker times. This tour covers the above-mentioned Roman Well, which was basically a dungeon back in the old days, as well as an Army bunker where members of the Communist party would meet in secret, the old gunpowder warehouse with old Roman artifacts, and another dungeon where you can learn about the brutal methods captors would use to extract history from their prisoners. If you’re a fan of the darker side of history, this is the tour for you! Tours are available daily at 11 AM with a minimum of two people, taking about 2 hours to complete. Check availability and pre-book here. If you’re visiting Belgrade in the winter, if you’re unable to walk for extended periods of time, or if you simply feel lazy (no judgment – you’ll tear our taxi app out of our cold, dead hands) while you’re in Belgrade, a bus tour may be the right choice for you! This tour encompasses pretty much all the essential sights in Belgrade, including Kalemegdan Park, Belgrade Fortress, the Serbian Orthodox Cathedral, Republic Square, Cathedral of St. Sava Church, and the confluence of the Sava and Danube Rivers. Tours are available every day at 10 AM and last three hours, part by minibus and part by foot. Check availability and book here. If you want a more active take on the traditional tour, why not join Belgrade’s own bike tour? 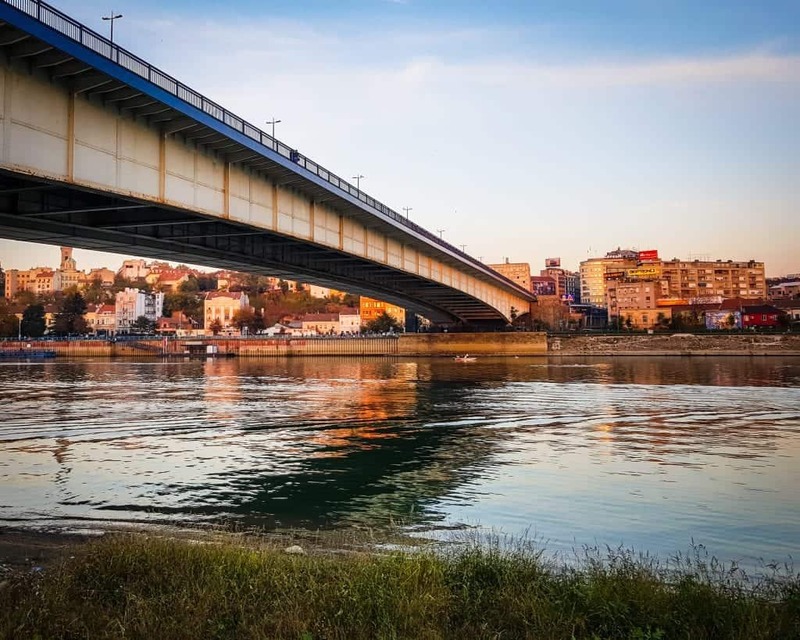 This tour takes you a bit off the beaten path, skipping the traffic of Old Belgrade to explore New Belgrade (Novi Beograd) and Zemun, which was once part of the Austro-Hungarian empire but is now incorporated into Belgrade proper. You’ll get to see Millennium Tower, Branko’s Bridge, the Palace of Serbia, the West Gate, and the Church of St. Nicholas, among other things. Tours leave at 3 PM, but they do not run in the winter, so check availability here. If you want to learn more about Serbian culture, a dinner and folklore night is a fantastic way to get to know more about Serbia. You’ll get to experience a traditional Balkan meal, see people dressed in traditional embroidered clothes, hear and see the unique folk dances of Serbia such as kolo, all with the assistance of a local guide who can answer any questions you might have. Shows are on Wednesday and Saturday nights at 7:30 PM and they require a large group, so inquire in advance before booking. 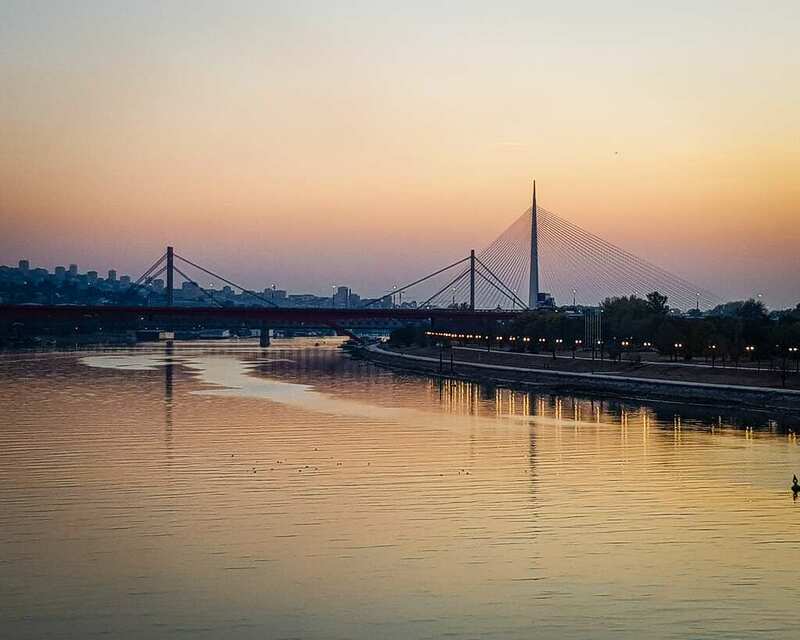 Belgrade is special for being a city built on not one but two rivers, and what better way to see Belgrade than from the water that’s been so crucial to the development of the city? Taking a river cruise is a great way to get acquainted with Belgrade, learn a bit of its history, and get some beautiful photos of your trip. 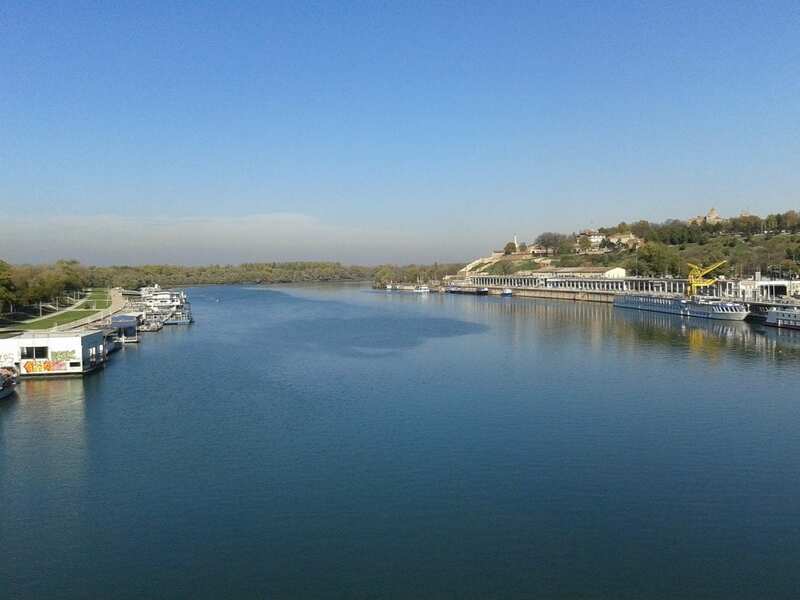 This cruise lasts 1.5 hours and includes information on Belgrade’s two rivers, the Sava and the Danube, and the important islands in the middle of the river, such as Great War Island. 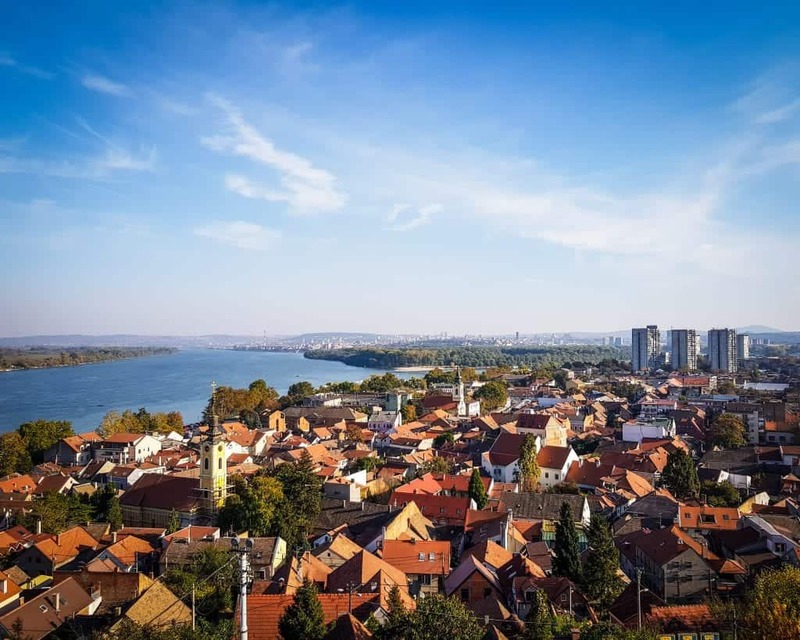 You’ll also be able to see Zemun town, now a municipality of Belgrade but formerly a part of Austro-Hungary, as well as see a glimpse of its iconic Millenium Tower. You’ll also get excellent views of the Belgrade Waterfront and the Belgrade Fortress and get great photos of Belgrade’s lovely skyline, including its beautiful bridges and towers. Check availability and pre-book here. If you’re a fan of beer, why not sample of Serbia’s best brews on a 3-hour “beer crawl” throughout the city? 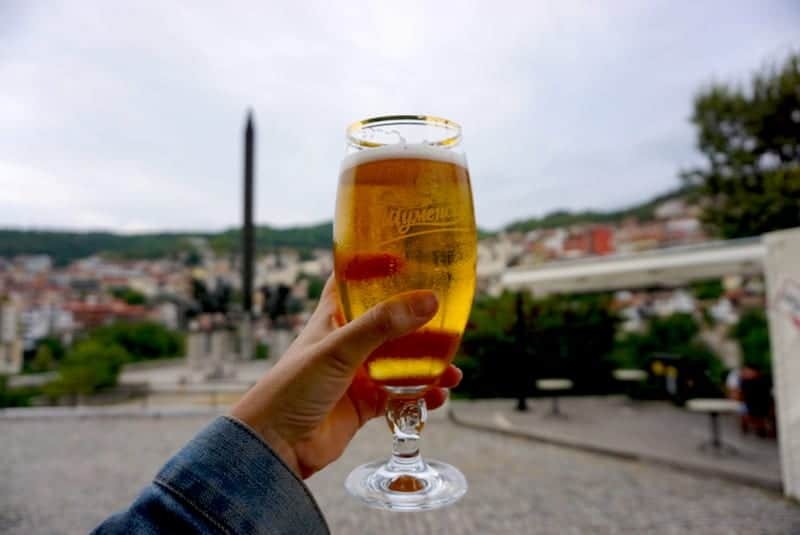 Sample five different beers in the first pub, then armed with the knowledge of your favorites, enjoy them in two other famous Belgrade pubs, all with the help of a local guide. Tours run every day but Sunday at 8:30 PM. You can check availability and pre-book here. Belgrade has several different eras of monuments and statues that you will see as you visit the city. There are pieces dating back to the Kingdom of Yugoslavia, as well as many communist memorials and monuments. Even if you don’t have time to tour the New Cemetary Open Air Museum (although we do suggest it! ), take the time to head to Ruzveltova Street to see one of Belgrade’s Spomeniks. Spomeniks are Yugoslav monuments designed in the Social Realism style popular in Communist countries. These mainly commemorate the struggle of the Yugoslav people to defeat fascism. 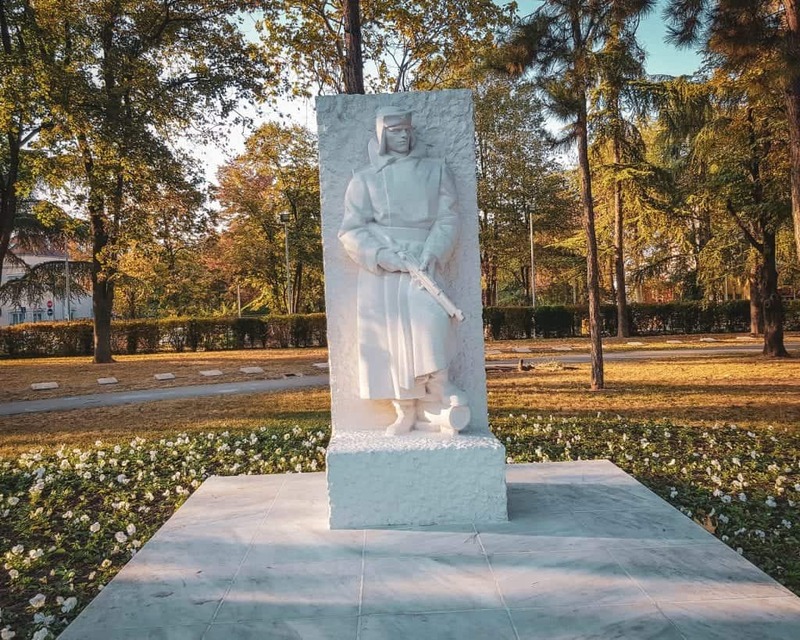 The one here has three components: a relief sculpture at the entrance, a statue of a Red Army soldier inside the cemetery, and a statue of a Yugoslav partisan out front to the left. If you want to see examples of Social Realism in Belgrade, this is one of the best places to stop. 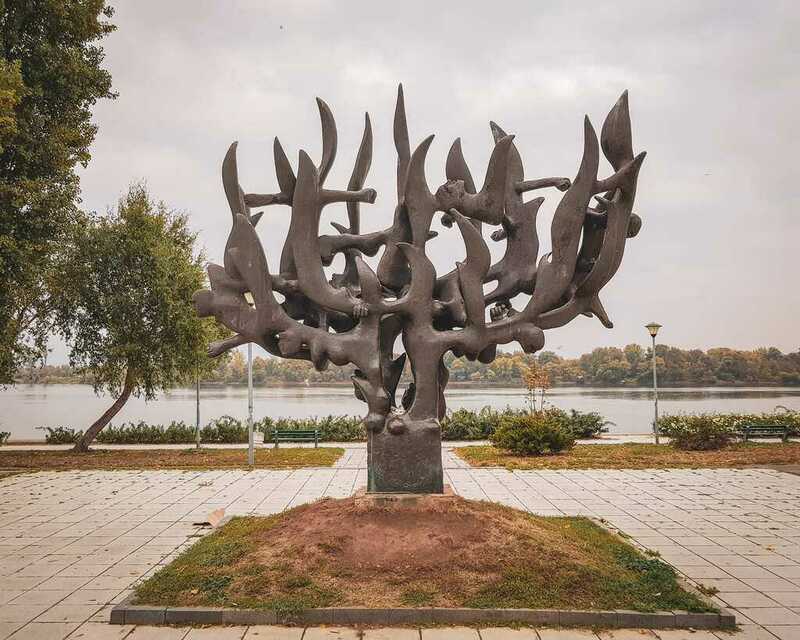 Located on the Dorćol promenade, this spomenik (monument) is shaped like a menorah on fire, a haunting piece of remembrance dedicated to the thousands of Serbian Jews who were murdered during the Holocaust. The front of the menorah spomenik (not pictured) is particularly ghastly, with faces of the dead carved into the monument, adding another layer of sadness to an already macabre monument. It’s a bit out of the way from any other sites (we took a taxi to get here) but it’s worth viewing if you’re a fan of Communist monuments or interested in learning about Jewish history in Serbia. Located in front of the National Assembly of Belgrade, these sculptures are quite unique. These two sculptures feature two men being literally crushed under the hooves of stallions. Some have interpreted this to represent the common man, being crushed by the powerful horses who represent authority. Of course, the location of this in front of the very seat of Serbian power is a bit ironic, given that these buildings tend to prefer to represent positive themes, such as justice and peace. If you visit Belgrade Fortress, you will undoubtedly see the figure of Pobednik standing tall over the city as if protecting it. Built to commemorate Serbia’s victory over the Austro-Hungarian and Ottoman empires, the man holds a falcon in one hand a sword in the other, one hand offering peace and the other, war. It’s wonderful to see this from both up close when visiting the fortress but also from the other side of the river along the Novi Beograd waterfront, where the statue seems to defend Belgrade Fortress from intruders. Note: As of October 2018, Republic Square is currently under construction, so be warned! While the statue is visible from the street, you cannot approach it. 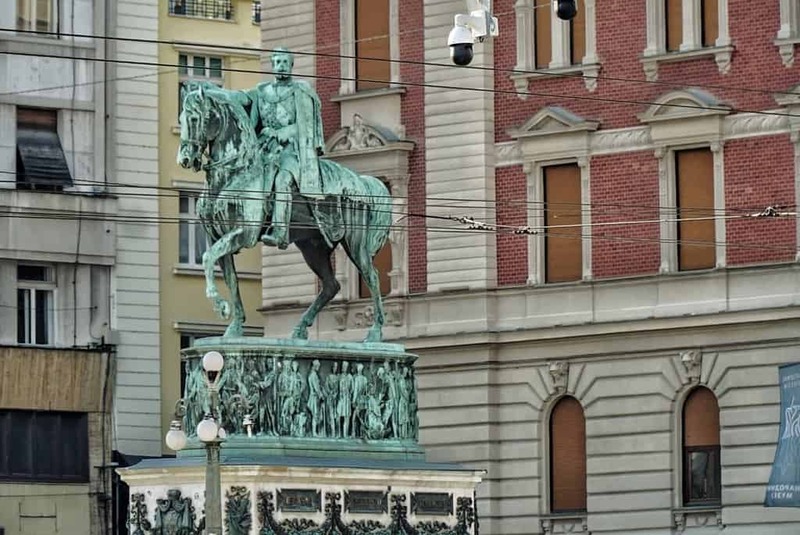 This equestrian statue in the middle of Republic Square dates back to 1882. It honors Prince Mihailo, the first ruler of Serbia as the country fought to win its independence from the ruling Ottoman Turks. The monument was so important to Serbians, that when it was unveiled they commemorated it by firing one hundred and one cannons. 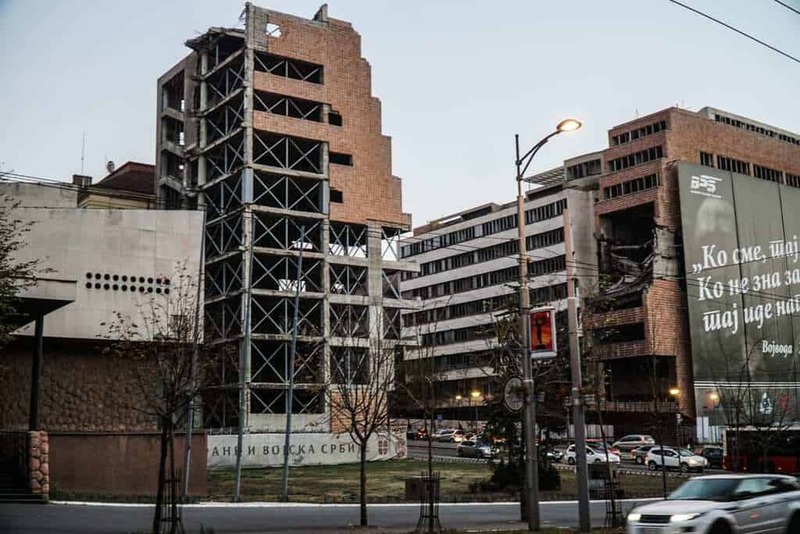 While the ruins of the former Yugoslav Army Headquarters are often visited by tourists, few people know about this Monument to the US Bombing of the Chinese Embassy, which was a stealth attack in the NATO bombing campaign. It took the lives of 3 people and wounded 20 others, and while it’s largely been swept under the rug by the international community, as you can imagine it is still a sore point for Serbia and China. You can read more history here. Like many countries in Eastern Europe, Belgrade has its own Monument to the Unknown Hero which is dedicated to the lost identities of World War I soldiers, and where the body of one unidentified soldier was buried. This is quite a bit out of town, on Avala Mountain near Avala Tower, but if you are already there or you have a special interested in World War I history, this is worth seeing. Situated behind the Hotel Yugoslavia on the edge of Zemunski Knej, the New Belgrade Spomenik is one of the many World War II memorials that the Yugoslav government commissioned. The importance of these memorials is not just to honor the war dead and others who sacrificed, but also to specifically call out their how Communism had defeated Fascism. Sajmishte Spomenik is located on the banks of the Sava river in Novi Beograd on the site of a former Nazi concentration camp. It commemorates the victims of the Sajmishte Concentration Camp, where over 20,000 Jews, Serbs, Roma, and other Nazi targets were murdered. It is believed that half of all Serbian Jews died here during the Nazi occupation. 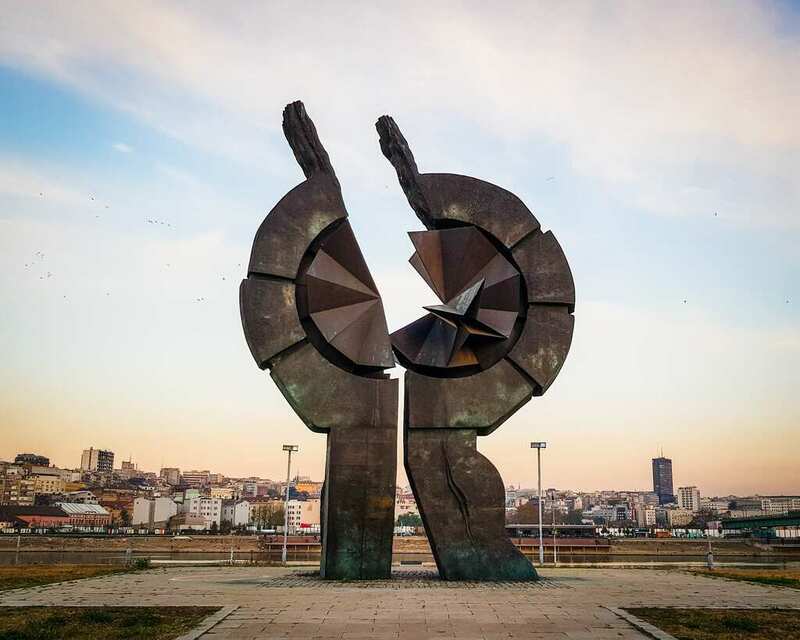 While the monument itself is notable for its status as a prominent work of social realism in Belgrade, remember that it commemorates the victims of an atrocity, so be respectful during your visit. Because Belgrade is located across two rivers and different neighborhoods were historically occupied by different empires, each neighborhood takes a huge amount of pride in its unique culture. Here are some of our favorite city neighborhoods and squares that you’ll want to make sure to visit while you’re in town. An urban neighborhood in Belgrade’s Stari Grad (Old City). Dorćol is split into Upper and Lower Dorćol and is located along the Danube river. The neighborhood features hip cafes, tons of street art, and nice restaurants. Important landmarks include the Dorćol spomenik and Bajrakli Mosque. Most city walking and food tours will make their way through Dorćol, but it’s also a great spot to wander alone in the afternoon, taking in the art and the buzz of the neighborhood. This square is close to the House of the National Assembly and is a common meeting place for many tours. It’s named for Nikola Pašić, who was the former mayor of Belgrade and who was at times the prime minister of Yugoslavia and the prime minister of Serbia, prior to Tito’s ascension. It was renamed in 1992; previously, it was called the Square of Marx and Engels. It’s most famous for being home to Dom Sindikata (Trade Union Hall), a massive curved Socialist Realist building influenced by modernism, which was declared a cultural monument in 2013. Novi Beograd is across the Sava river and connected with the Stari Grade by a series of bridges (above). Its name means “New Belgrade.” Along with Brasilia, Brazil, and Velenje, Slovenia, Novi Beograd is considered one of the best examples of urban modern architecture. While outsiders might consider this to be a monotonous series of concrete housing towers and parks, locals have affectionate nicknames for the different buildings. Currently, about 200,000 thousand people live in this part of Belgrade. 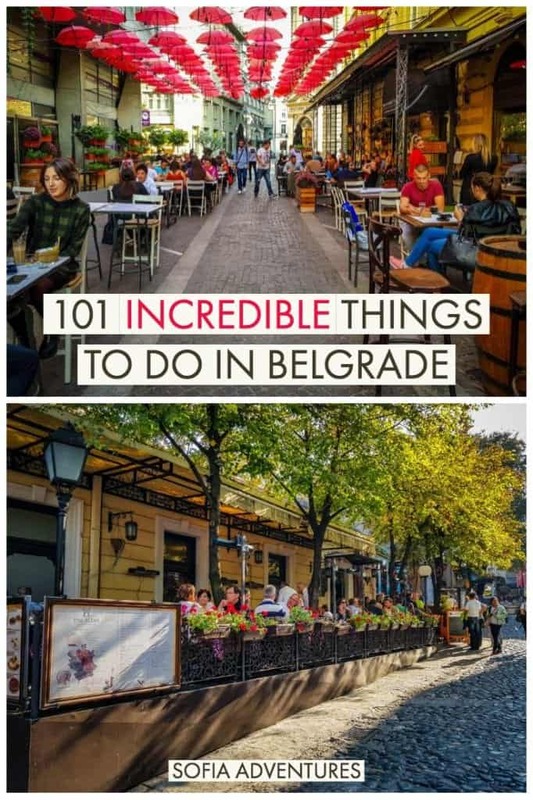 Many of the sites on this list are in Novi Beograd, but if that’s not a tempting enough reason to convince you to visit, note that it also offers some of the best views of the Old City from across the river, making it a spectacular place for photographers to stop by. Note: As of October 2018, Republic Square is currently under construction, so be warned! One of the main squares in Belgrade, you will most likely end up at Republic Square at least accidentally during some point of your travels. Republic Square is where one of the most famous statues in Belgrade can be found, the Spomenik (Monument) to Knez Mihail. Here is also where you’ll find the National Museum of Belgrade, newly opened after 10 years of renovations. You’ll also find the National Theater on the other side. 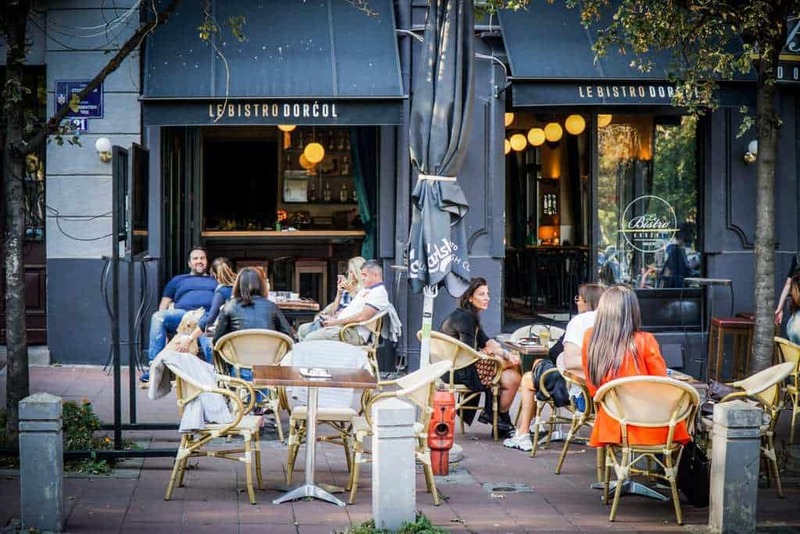 There is plenty of café seating and on sunny, warm days you’ll see a lot of locals and tourists alike enjoying a drink in Belgrade’s most famous square. Centered around Skardrska Street (see above) this is the historically Bohemian neighborhood, turned into a pleasant tourist district full of restaurants, hostels, and bars. 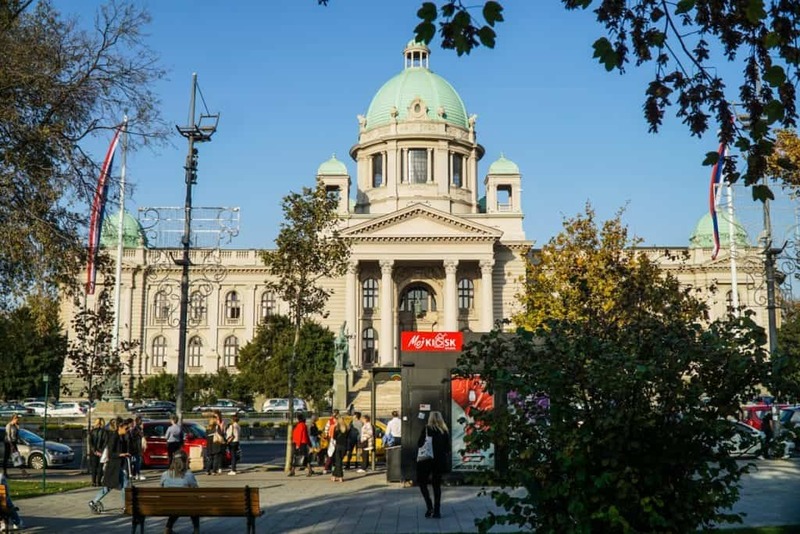 No trip to Belgrade is complete without at least passing through here, and first-time visitors will find themselves drawn to the delightfully touristy atmosphere mixed with a bit of old world Belgrade. There’ are so many waterfront areas in Belgrade that its hard to pick which one we love the most. The Belgrade Waterfront is a section from the Belgrade Fair to Branko’s Bridge which is currently being restored. The section from Branko’s Bridge down to the Belgrade Fortress has hip restaurants and a fun vibe. The waterfront in Novi Beograd is where you can find the Splavovi and dance the night away. Plus there are promenades in many areas. We especially love visiting the ones in Zemun and Dorcol. Zemun is now incorporated into Belgrade and is considered a suburb of the city. However, in the past, it actually used to be its own city and was even part of the Austro-Hungarian empire for a time. 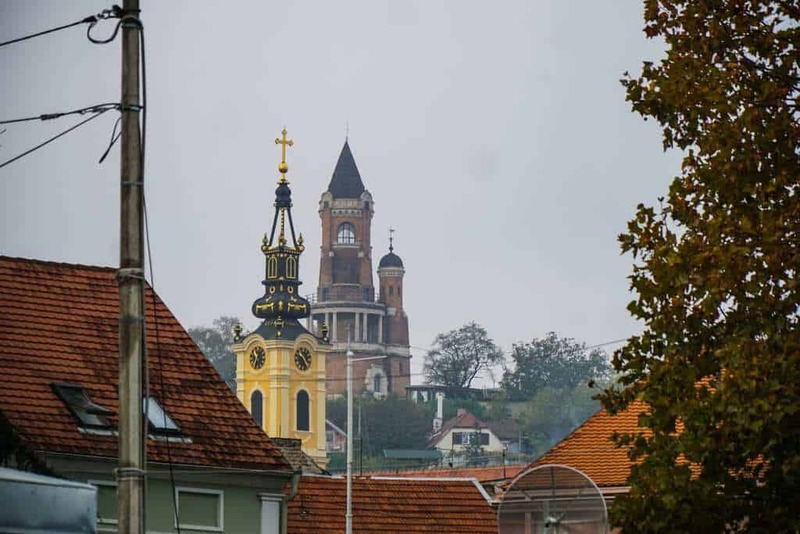 As a result, the architecture in Zemun is very different than in Belgrade, despite their proximity, as Belgrade was only occupied by Austria-Hungary for a very short amount of time in comparison. You’ll find cobblestone streets and churches done in the Austro-Hungarian style, which is unique compared to Belgrade. It’ so different that we actually suggest you go as its own day trip from Belgrade! Belgrade has some amazing museums! Here we list all fo the first-rate museums in Belgrade, but we’re still making our way through them ourselves. We know that no one stopping in Belgrade for a few days will have time to go to each of these, but we want you to know the overview of them so you can choose for yourselves based on your personal interests. 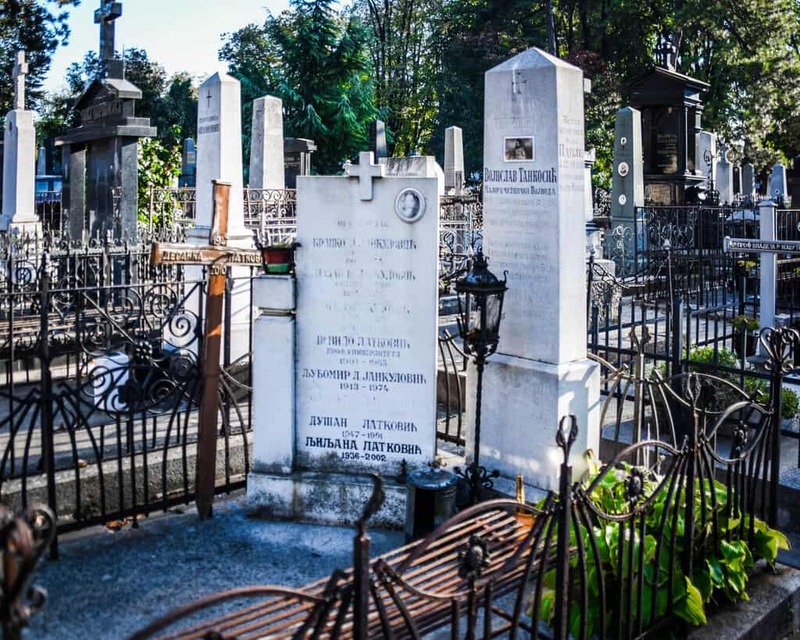 Our personal favorites are the Nikola Tesla Museum, the Museum of Yugoslavia, the Museum of Contemporary Arts, and the New Belgrade Cemetary Open Air Museum. Located on Republic Square, the National Museum in Belgrade recently underwent a full renovation that left it closed for years. 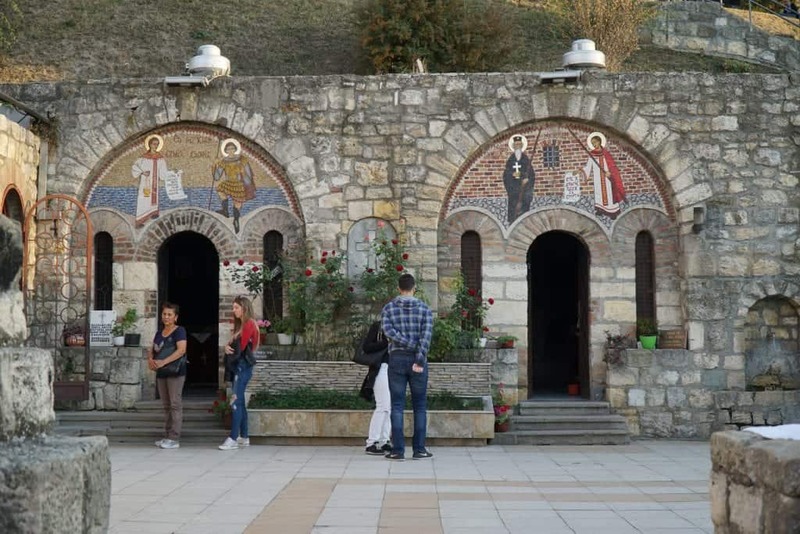 Now that it’s reopened, visitors can come in and explore Serbian history and art from the Paleolithic era through the end of the twentieth century. Highlights include ancient Greek and Roman artifacts, Byzantine and medieval religious art, and Yugoslav paintings from the 18th through 20th centuries. The museum is open from Tuesdays through Sundays, and it stays open late on Thursdays and Saturdays. Note that the museum is closed on Sundays. The Belgrade City Museum focuses on Serbian painters, but it also has works by famous foreign painters as well. There are 2500 works in the collection, so this is by no means a small museum, though it may not be the city’s most famous. There are also permanent collections on the history Belgrade and Zemun, as well as special exhibits and events. 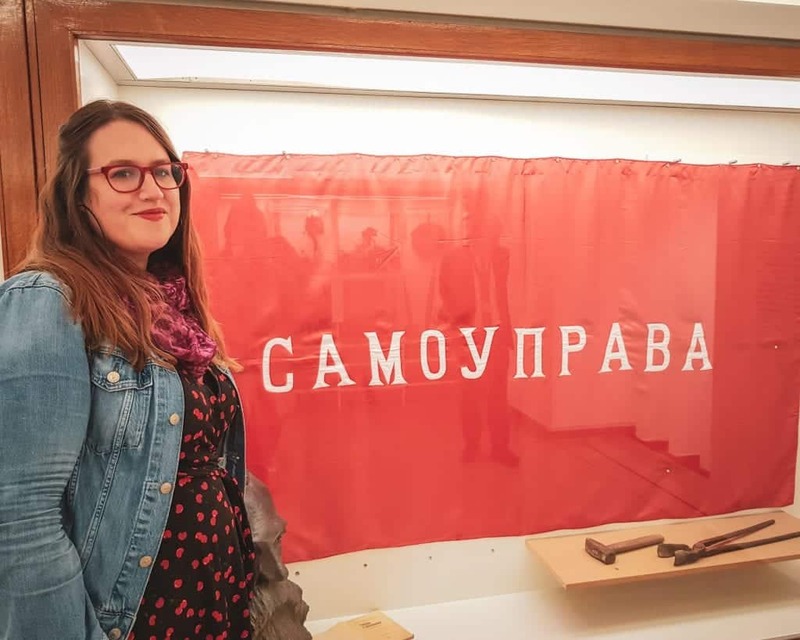 If you want to get a glimpse of what traditional life was like in Serbia, along with beautiful traditional Serbian dress, head to the Ethnographic Museum. One of the oldest museums in the Balkans, much of their original collection was destroyed during World War I. However, they reopened in 1920 and began their collection anew. Today they have three floors of exhibits on traditional life in Serbia. Dedicated to the preservation and understanding of Serbian history, the historical museum displays important objects to help visitors understand the history of Serbia dating back millennia. Highlights include medieval weaponry, maps, and historical posters. 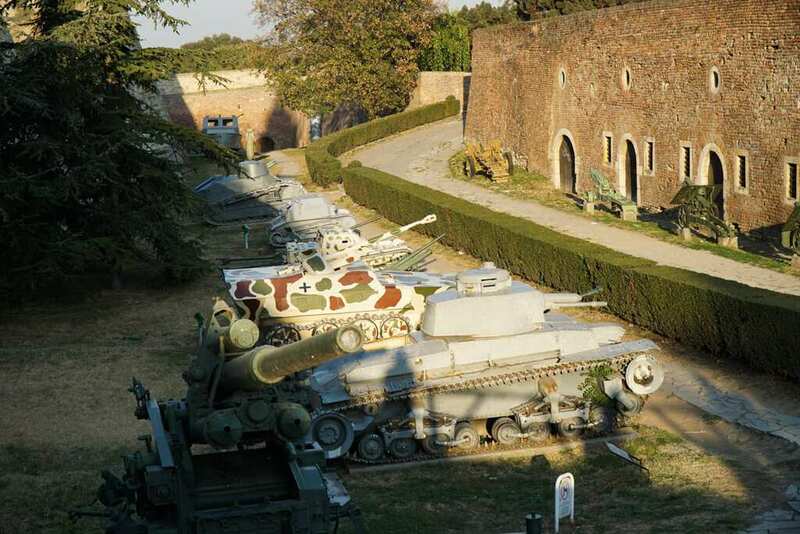 It’s hard to miss at least spotting this museum since it’s located inside the Belgrade Fortress! It contains everything you would expect a military museum to display, including a weapons collection from different historical eras. Don’t miss the armor of the Turkish vizier or their collection of Turkish lances from the period when Serbia was under the Ottoman rule. The only museum in Serbia dedicated to African arts and culture, the Museum of African Art was initially based on the collection of a Yugoslav diplomat to Africa. Featuring a large collection of African masks and works from West Africa, it contains many rare pieces collected during his travels. Today the collection belongs to the City of Belgrade. Featuring the artistic value of functional objects, the Museum of Applied Arts has a large collection of metalworks, textiles, photography, and furniture. The oldest pieces in the museum are ancient Greek coins, with other highlights including Serbian wedding dresses and twentieth-century fashion. Anyone flying into Belgrade will notice this oddly shaped modern building as they head into the city. The Museum of Aviation looks more like a cousin of the Western Gate (above) than a museum. However, the planes in the yard will give it away. The museum owns over two hundred aircraft, including planes flown by the Yugoslav Air Force, rockets, and radars. One piece that’s hard to miss is the two planes that were shot down during the 1999 NATO bombing of Belgrade. 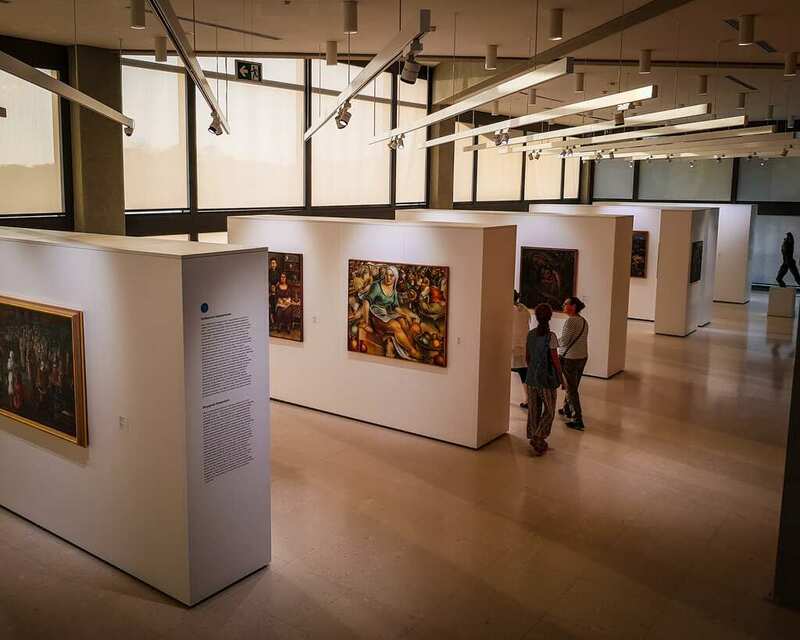 This museum in Novi Beograd focuses on Yugoslav artwork in the twentieth and twenty-first centuries and covers the period from the Kingdom of Yugoslavia through today. The museum is beautifully laid out and includes thought-provoking pieces that grapple with the major political changes that the citizens of Yugoslavia went through during this time. Located near Branko’s bridge in Novi Beograd, it’s an easy walk from Stari Grad (or you can grab an inexpensive taxi on Car.Go). Bonus: the museum is free to visit on Wednesdays. 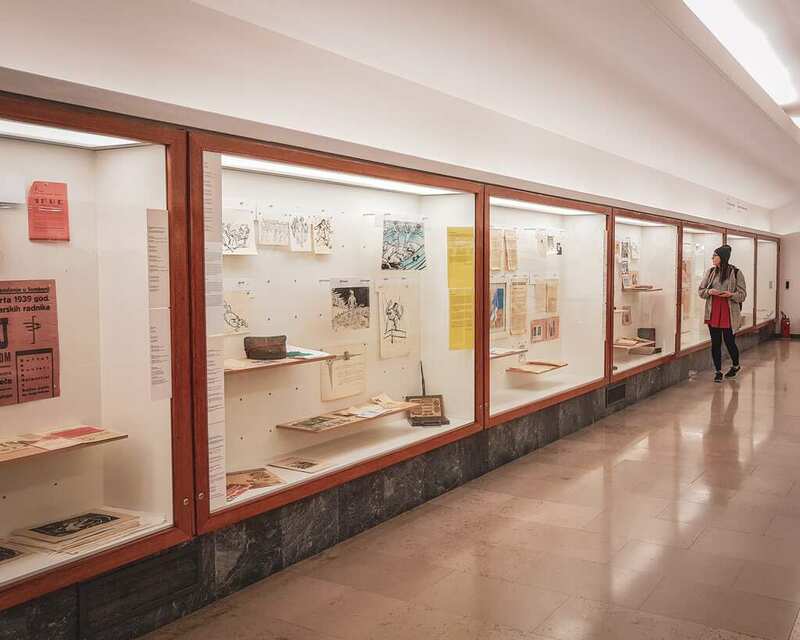 For lovers of theatrical history, the Museum of Theatre Arts houses posters, photographs, letters, and other documents relating to the history of Yugoslav theater. Located on the grounds of the House of Flowers, this museum houses Joseph Tito’s personal artifacts, along with items from the Yugoslav era. I enjoyed perusing the old maps, propaganda posters, and even the vintage cameras that belonged to Tito. Note: The museum is small, and there are no bathrooms on the property. If you need to use the restroom while here or at the House of Flowers, you’ll need to use the porta-potties outside of the entrance. Like many places labeled “new” in Europe, Belgrade’s New Cemetary is older than some American states and the nation of Canada. Built in 1886, it was the third Christian cemetery in the city. It is divided into three main parts: the Christian cemetery, the Jewish cemetery, and the Cemetary of Belgrade Liberators. The cemetery has been designated as an open-air museum and one of the most important historic cemeteries in Europe. Visiting is free and offers both a glimpse into Serbia’s past and the ability to confront your misconceptions about Yugoslavia during World War II and the Holocaust. 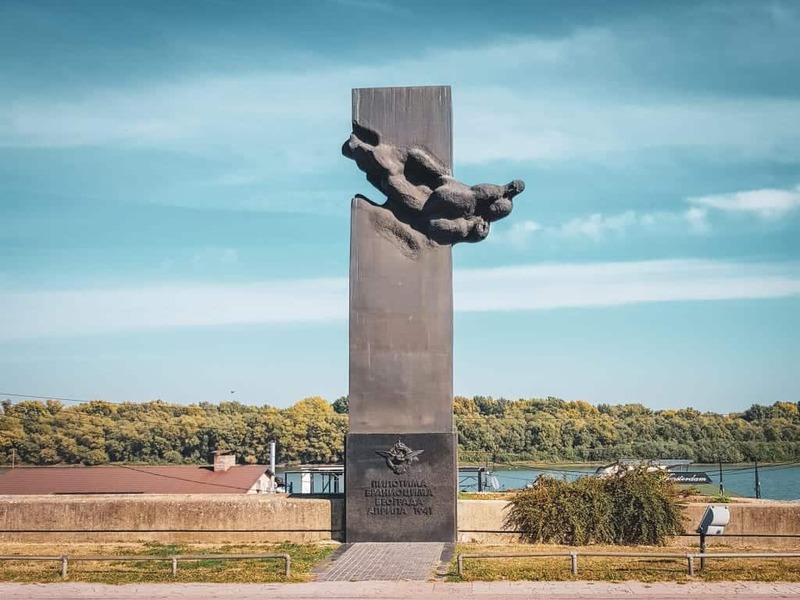 Make sure to see the Alley of Great Serbians in the Christian section, the Spomenik in the Liberator’s cemetery and the Holocaust Memorial in the Jewish section. 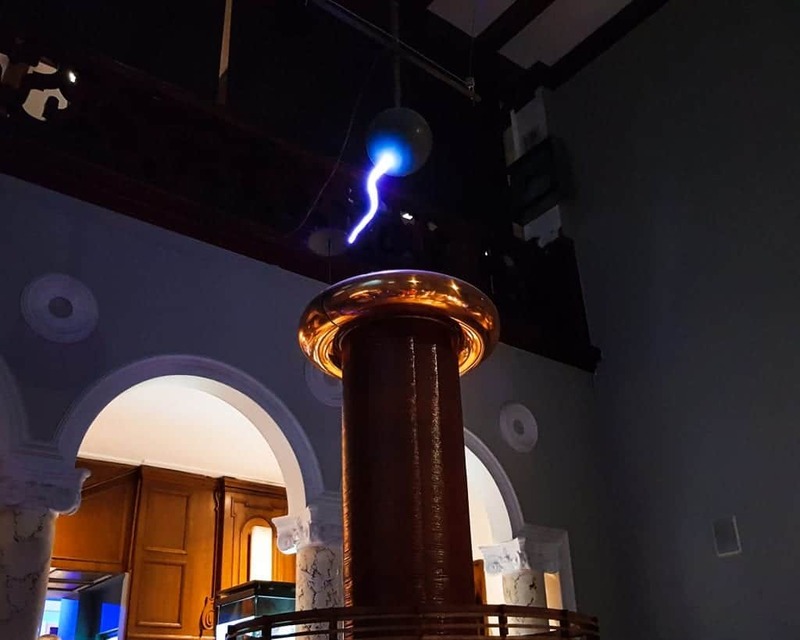 If you want to see the Tesla Coil in action, head to the Nikola Tesla Museum! This museum explores the life and works of one of Serbia’s national heroes, the great inventor Nikola Tesla. While he was born in modern-day Croatia and spent most of his life in the United States, he is one of the most famous Serbs in history and even the airport here is named after him. To see why his works have made such an impact on the world, spend an hour on a guided tour at the museum, which includes interactive demonstrations of some of his coolest inventions. For true train lovers, the Railway Museum contains a large collection of objects and documents related to the history of rail travel in the former Yugoslavia, including multiple important locomotives from the nineteenth century. For those who want to visit Tito’s Blue Train, visits are typically coordinated by a combination of work from the tourist office, the Railway Museum, and the railway company. The Kingdom of Yugoslavia might have existed for only a hundred years, but they were busy using this time to build beautiful royal palaces and residences that are open to the public today. Most visitors to Belgrade will spot the Princess’s house across the street from the St. Michael’s Cathedral. Princess Ljubica was the wife of Prince Milos. The building has served many purposed since it was originally built in 1829, but it was restored to show what an upper-class Serbian home looked like in the nineteenth century. Tickets are 200 RSD (about $2 USD). The palace was built for Prince Milos in 1831, and he used it occasionally until the end of his reign in 1839. The residence now houses the Museum of the First Serbian Uprising, celebrating Serbia’s fight to throw off Ottoman rule. 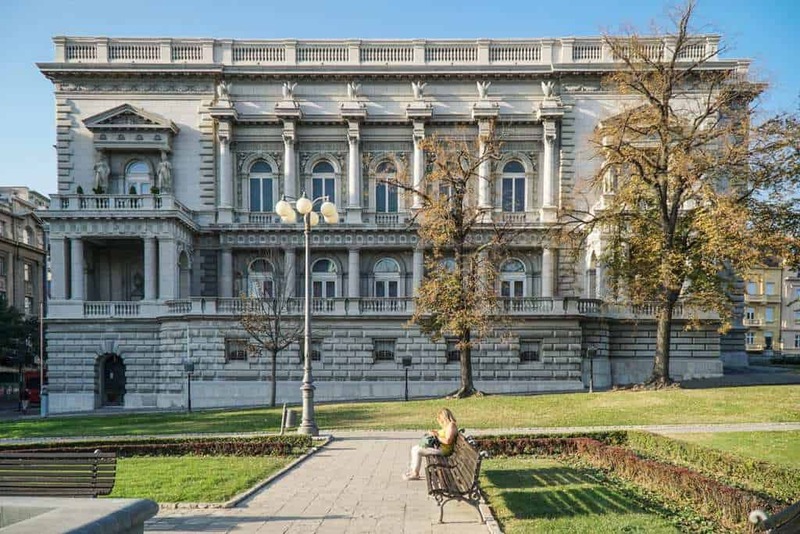 In central Belgrade, two palaces sit facing each other, Novi Dvor and Stari Dvor (New Palace and Old Palace), connected by Andrićev Venac in the middle with its lovely fountains and benches. In the past, Novi Dvor was a royal residence for the Karađorđević dynasty, which ruled over Serbia and then later the Kingdom of Yugoslavia. In the communist period, a park was created to connect it and the Royal Assembly nearby, which was called Pioneers’ Park. Currently, it is the seat for the President of Serbia. Created in 1884, this ornate royal palace used to be home to the Obrenović dynasty, who ruled over Serbia prior to the Karađorđević family. It was damaged badly in both World War I and II but has since been restored to its prior beauty. 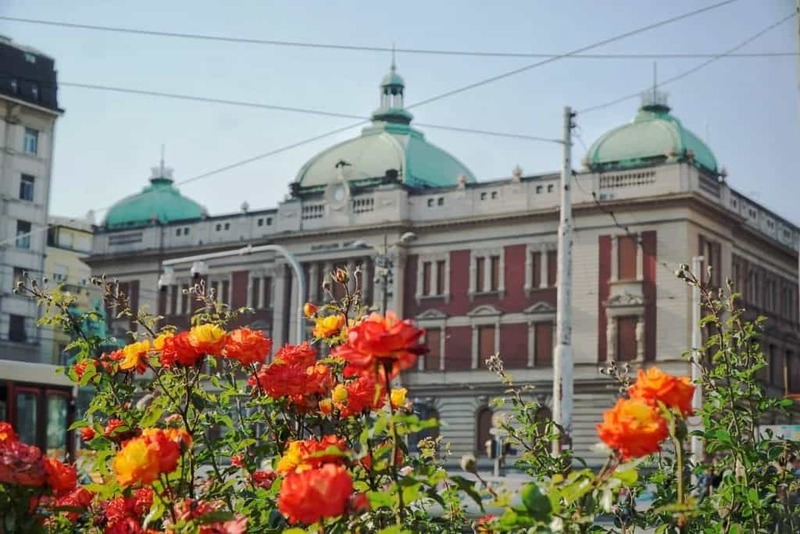 Today, it is the City Assembly of Belgrade, and you can take a tour inside the Old Palace – inquire at one of the tourist information offices in Belgrade or at a local tour agency. Built in the 1920’s for King Alexander I, the palace’s style is Serbian-Byzantine. It is the current home of Crown Prince Alexander and his family. The Royal Palace and the White Palace (below) are two separate royal residences in the same park and can be visited together on a guided tour. There’s no entrance to either without the tour, which operates on Wednesdays, Saturdays, and Sundays. Note that English tours are only offered in English on Wednesdays and Saturdays, while tours in Serbian are available on Saturdays and Sundays. You can check their updated schedule here. The White Palace was built by King Alexander I in the 1930’s for his three sons. Unlike the nearby Royal Palace, the White Palace looks more like a stereotypical royal residence built in the classical style with heavy French influence. The White Palace is on the same grounds as the Royal Palace (above) and has the same tour schedule and rules. Belgrade is a city with tons of parks and green spaces. Because it also sits between two rivers, there are riverfront beaches and islands as well. While Belgrade might not be on your radar as the ultimate beach vacation, this city certainly has enough beaches and parks for you to get your outdoor fix while here. A river island in the middle of the Sava, Ada Ciganlija is a popular place when the weather turns nice. Full of beaches and other outdoor sporting centers, it’s a great spot to come out and play in the summer months. Note that it’s no hidden gem: in the summer there can be over a hundred thousand visitors to the island! Technically a mountain (though you’ll be forgiven for thinking it’s a tall hill) Avala stands to the southeast of Belgrade. Visitors come to enjoy hiking and taking in panoramic views of Belgrade and Vojvodina. 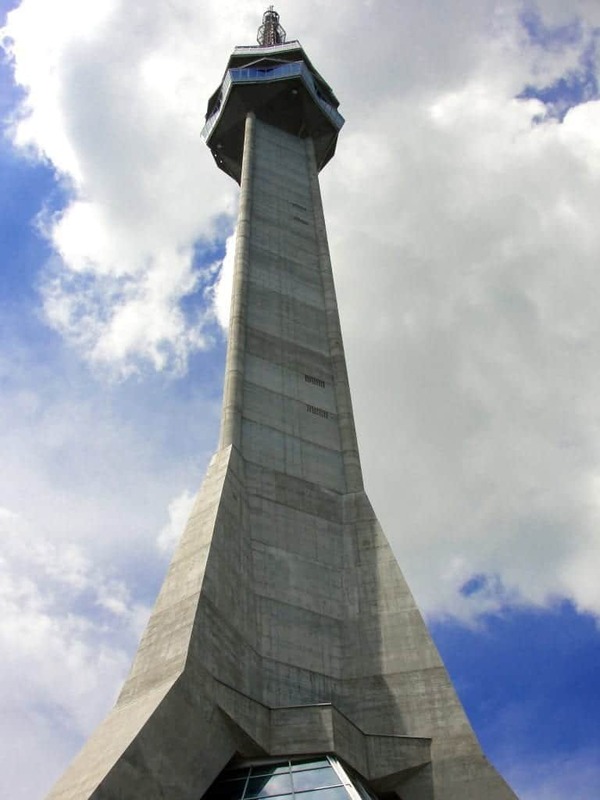 Prominent features on Avala include the Avala TV Tower and the Monument to the Unknown Hero. Historically skiing has been an important activity on Avala, and there’s a new ski facility expected to open in 2019. Located where the Danube and Sava rivers join, Great War Island is a large river island that is part of Zemun. During the summer, residents build a pontoon bridge to the island, which has sandy beaches and some of the best swimming spots in Belgrade. It’s also accessible by boat. Besides serving as an important swimming spot, the island houses an important nature preserve which is home to almost two hundred kinds of birds, including many endangered species. A lovely breath of fresh air in sometimes smoggy Belgrade, Jevremovac Botanical Gardens are truly a delight. Located a bit outside Stari Grad in Palilula, this was close to where we stayed in our Airbnb during our last visit to Belgrade. 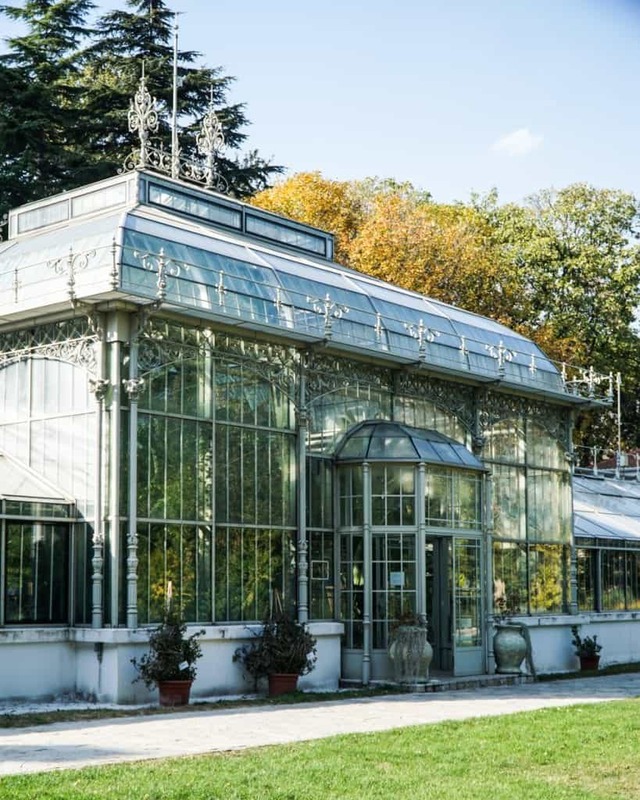 With a gorgeous greenhouse containing tropical plants, ferns, and succulents alike, as well as a forested area with plenty of walkways, we found this to be one of the more beautiful hidden gems of Belgrade. It’s almost hard to tell where Kalemegdan Park ends and the Belgrade Fortress begins, and that is part of its charm. Kalemegdan Park is one of the centers of Belgrade life, where people come to relax and enjoy some peace and quiet away from the buzz of traffic. A small green park near the Church of Saint Sava, there are a few monuments throughout. The real highlight here is the dog park, which locals use to get their furry friends some exercise. Because of the dog park, there are dozens of dogs here, some running in the fenced-in area, while others are walked by their owners on leashes. If you are traveling Belgrade with a dog, or are merely homesick for your own furbaby, this is a great place to get in some dog cuddles and kisses (provided the owners are cool with it, of course). Studentski Park (Student’s Park) is a small park with a few monuments in central Belgrade, facing the beautiful Captain Misa’s Edifice. 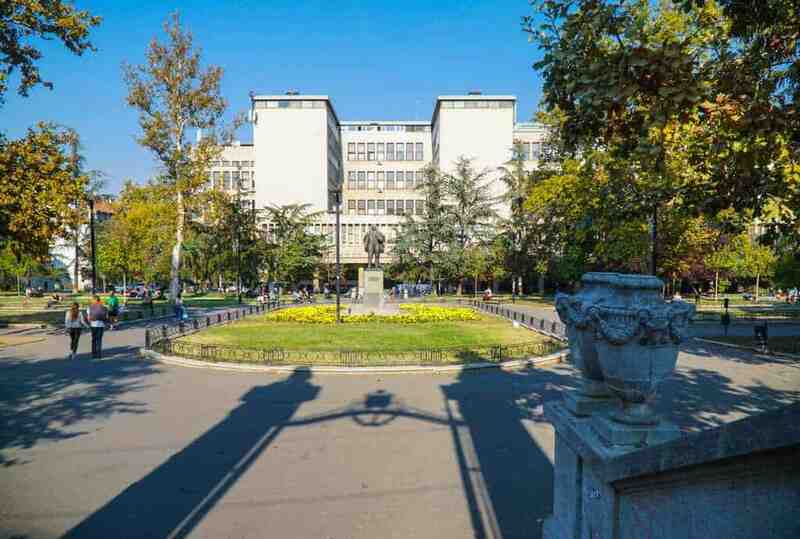 It’s called Studentski Park as it’s located quite close to Studentski Trg (Student’s Square) which houses several faculties of the local university as well as the cultural center. A nice park next to St. Mark’s which includes playgrounds and a dog park. The highlight here is the small trolley track that comes in off the street. Because the trolleys slow down and sometimes park here, this is one of the best spots in the city for getting an Instagram pic with one of the iconic Belgrade vintage trams. Hurry and come to Belgrade to see these before the city gets around to upgrading to all modern trolleys in the future. Zemunski Kej is a large park that runs along the water in Zemun down to the Hotel Yugoslavia. 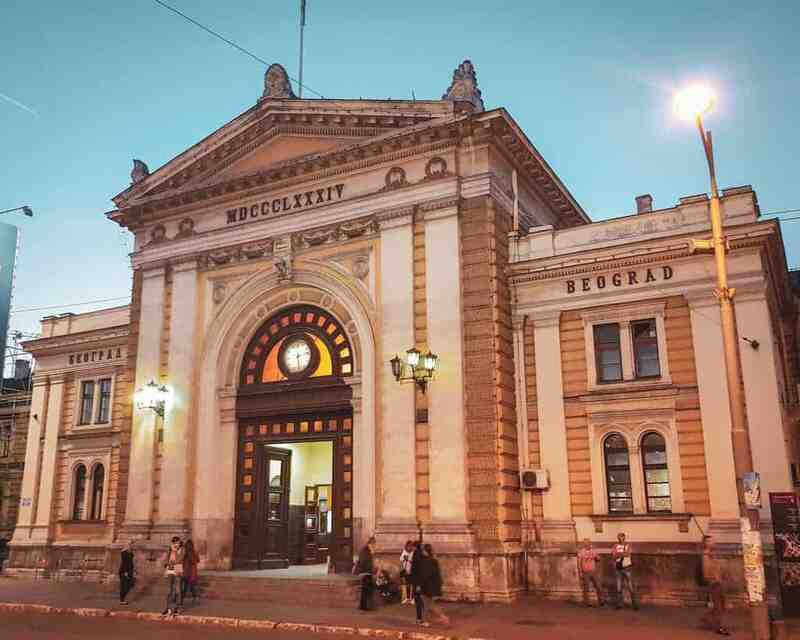 There are several interest points here, like the freestanding columns from one of Belgrade’s earliest train stations, and the rock climbing station. 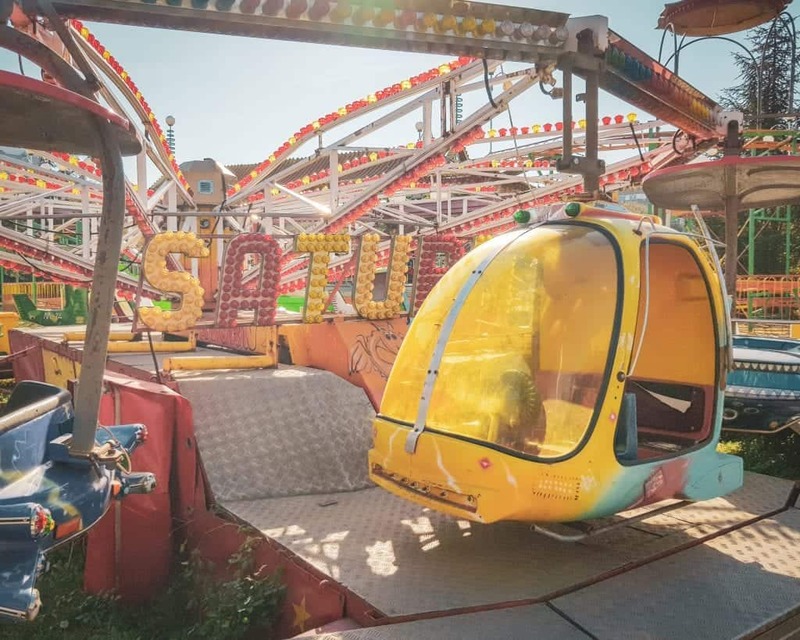 My personal favorite is this small amusement park, which was empty when I visited in October, making it the perfect place to practice some creepy Carnival photography. Belgrade is a cultural capital, and as such it has great restaurants and cafes, along with unique and exciting nightlife options. Here are just a few options for food and nightlife activities that showcase the best of Belgrade. Most tourists who come to Belgrade are sure to see the gorgeous Hotel Moskva building, but give yourself time to enjoy their homemade Moskva Schnitt. This famous cake (which pairs delightfully with white wine) is a Belgrade delicacy and a great way to enjoy a quiet hour during your trip. We went as the final activity on our last trip to Belgrade, and it was a great way to unwind and enjoy the city before leaving. Think the class of a Vienna cafe paired with the coolness of Belgrade (and at Belgrade prices). 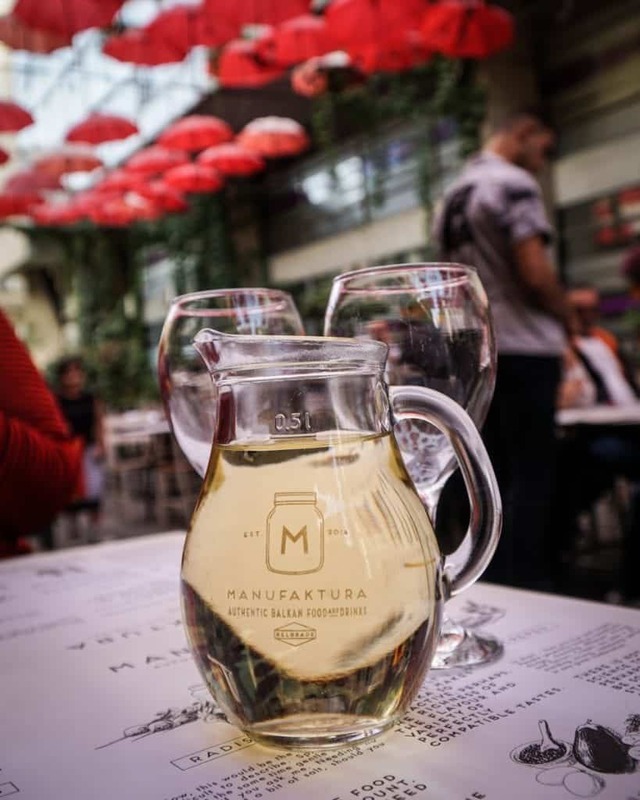 Manufaktura offers a modern take on traditional Serbian food that is seriously delicious. it’s also the restaurant with the best Instagram game in town, as its garden roof is made of red umbrellas. During warm months, eating in the garden is one of the liveliest places to be in the city. Because we live in Bulgaria and there’s a lot of overlap between Balkan cuisines, when we’re in Balkan capitals we like to explore the international food scene to get our food fix. 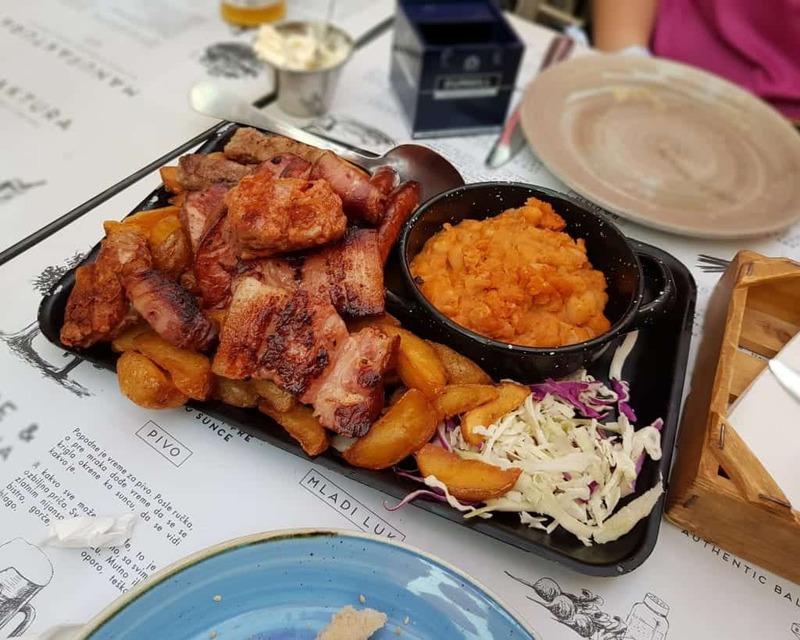 We were delighted to find that Belgrade has a surprisingly diverse ethnic food scene with some seriously delicious food. 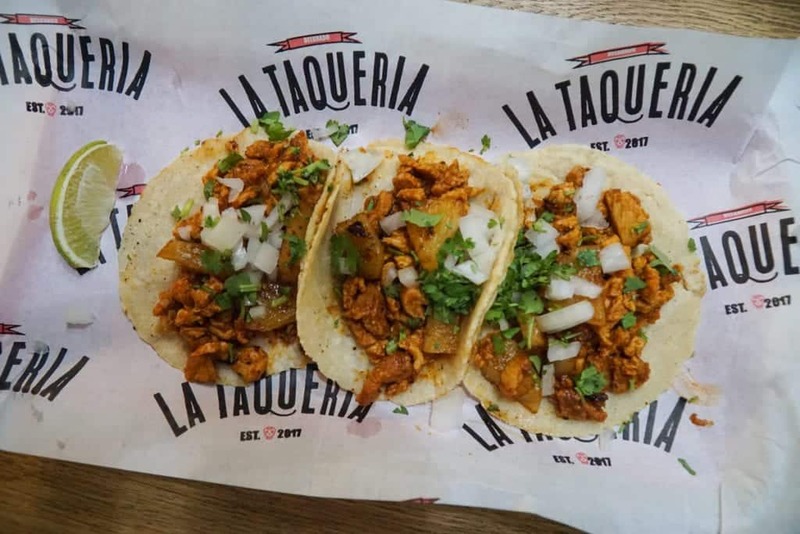 Our top winner was La Taqueria, which I’ll wager is the best damn Mexican food in Europe – no, seriously. Before you think I’ve gone crazy from Europe-induced Mexican food withdrawal, this place is the real deal. The chef is from Mexico and takes bringing authentic Mexican food to Belgrade so seriously that this absolute legend actually imports his own nixtamalized corn meal from Mexico to make his own mouth-wateringly perfect tortillas. The fillings are equally delicious; my two favorites are the pineapple and achiote-rubbed pork al pastor and the delicious classic, carnitas. However, we also have a soft spot for Nachos, a Tex-Mex restaurant that serves up delicious nachos, guacamole, and fajitas. It’s not quite as authentically Tex-Mex as La Taqueria is authentically Mexican, but it is delicious and will definitely sate your Tex-Mex cravings. One of the major winners of our time in Belgrade was Istok, a Vietnamese-Korean-Asian fusion restaurant. We ate there several times – at least three, more likely four – over our most recent stay in Belgrade. 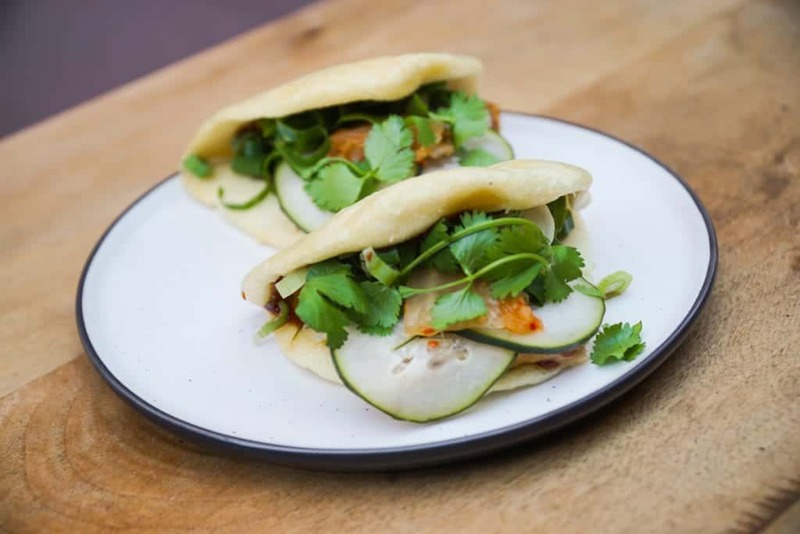 Our favorites are the pork bao buns (always), the bibimbap, the pork belly, the sticky pork, and the summer rolls. Less impressive but still tasty were the pho, fried tofu, and steamed wontons. If you’re having any kind of Asian craving while in Belgrade, Istok will likely scratch that itch! Of course, though, you should definitely try some local Serbian dishes, especially if you only have limited time in Serbia and want to get a sense of what their cuisine is like! 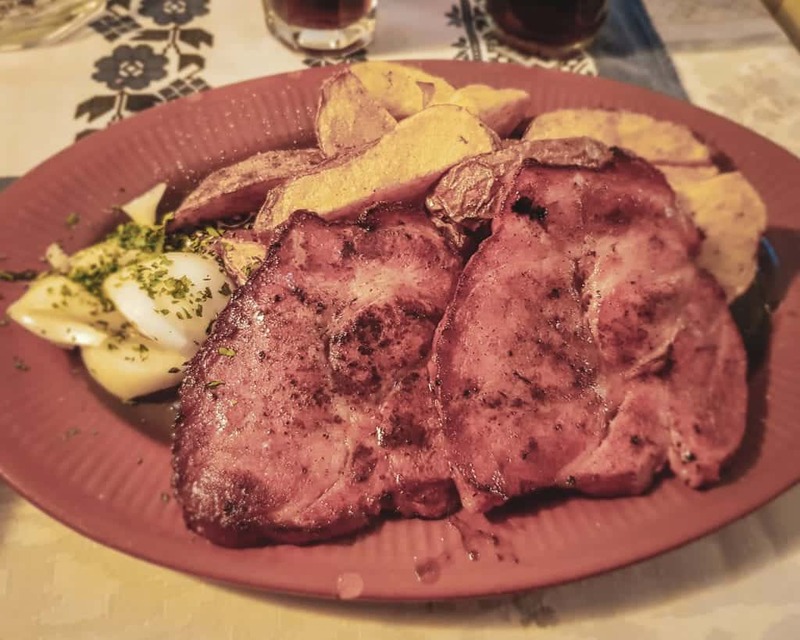 The most ubiquitous Serbian food is barbecued meat (ròštīlj) – you will find a selection on basically any menu in Serbia. The most common dish is ćevapi (sometimes written ćevapčići) which are skinless pork-and-beef sausages, usually served in portions of 5 or 10 and often with a side of kajmak, a fresh Serbian “new” cheese similar to clotted cream. It’s really tasty! Another thing you won’t be able to miss is pljeskavica, Serbia’s version of the hamburger, which is occasionally stuffed with cheese for extra sinfulness. My personal favorite is karađorđeva šnicla, a rolled, breaded piece of pork or veal stuffed with kajmak and then some ham for good measure. A heart attack on a plate, but it’s quite delicious! Another one of my favorite Serbian dishes is pasulj, a bean soup with spicy sausage. And of course, you can’t miss the chance to order a shopska salad, which is Bulgarian in origin but well-loved in Serbia! If you’re vegan, a srpska salad will be one of your few choices – it’s like a shopska salad but without the cheese. Our favorite restaurants in Belgrade for Serbian food include Manufaktura, Dva Jelena, and Zavičaj. Who here knew that Serbia was a wine-producing country? I had no idea until a few years ago when I toured the vineyards of Vojvodina on a day trip from Novi Sad. The wines from the Fruška Gora region of Serbia are absolutely delicious, especially white wines made with Temjanika, a unique Balkan grape varietal popular in Serbia and Macedonia that is related to Muscat. It has a beautiful floral smell but is nice and dry, perfect for warm days drinking outside in the late fall! We also fell in love with bermet, a sweet dessert wine vinified with herbs and spices so that it’s almost like a digestif or a vermouth. However, these are rare and you may have to make a side trip to Sremski Karlovci (near Novi Sad) in order to sample these for yourself – we don’t recall seeing these on the menu anywhere. I mean, have you even been to the Balkans if you haven’t had rakia forced upon you at some point in your travels? Serbian rakia, like virtually all versions of rakia, is practically liquid fire, but it’s not without its charms (or hangovers). We enjoyed trying a few different rakias during our wine tasting in Sremski Karlovci – my personal favorite was the quince, Stephanie liked the apricot, and the plum rakia made us both die a little inside. 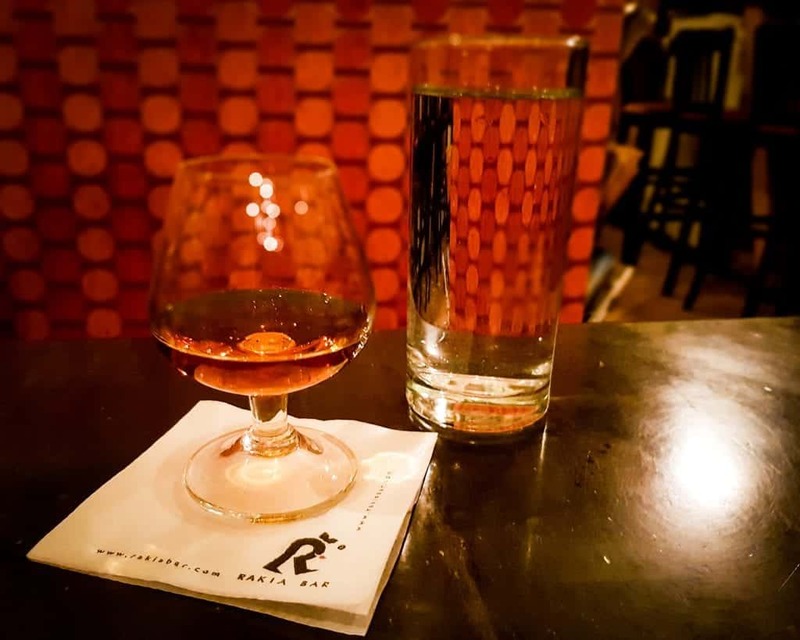 In Belgrade, we enjoyed sampling rakia at the Rakia Bar downtown. You can also often try rakia on Skadarska Street for 100 dinars ($1 USD) per shot. 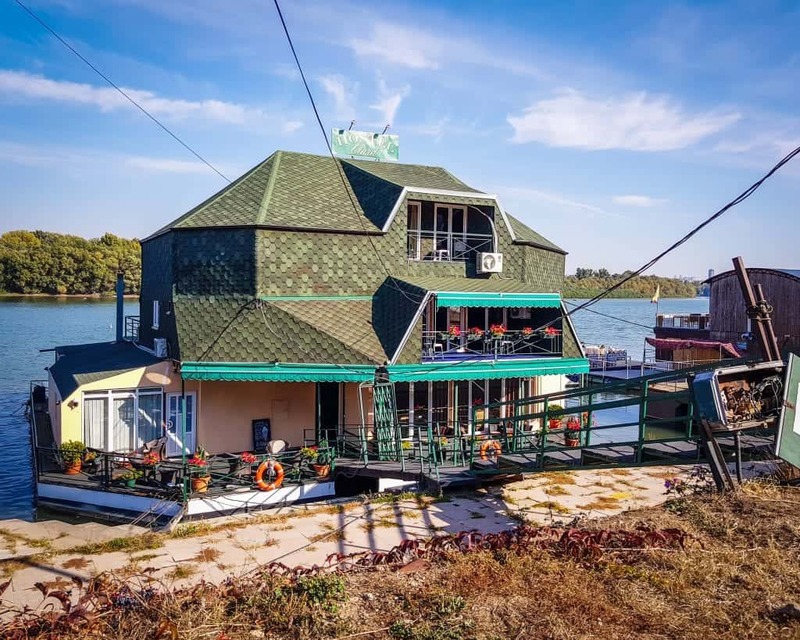 if you’re looking for one of the most unique things to do in Belgrade, partying on a floating barge has got to be one of them! 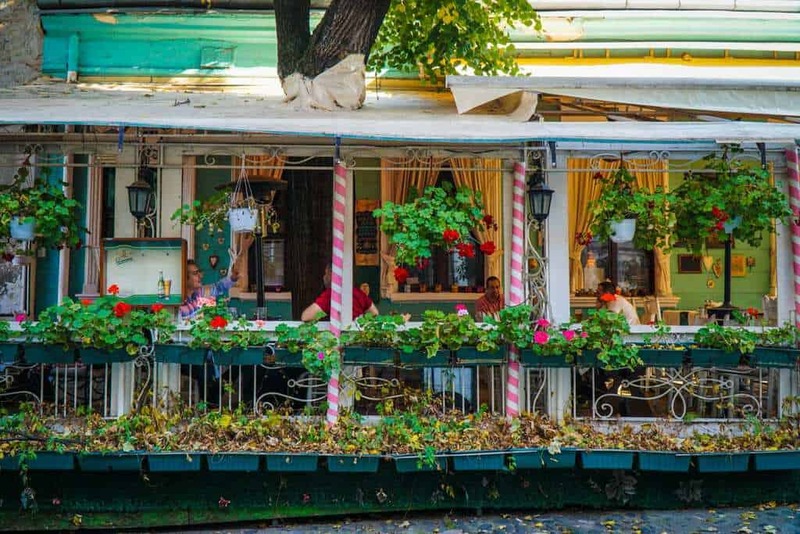 These riverside clubs, called splavovi or splavs, are a Belgrade institution. Located on the banks of the Sava, these clubs go all night and well into the morning. I really enjoyed the scene at Klub 20/44, but Splav HotMess is clearly where I’d go next time because that name speaks to my soul. Most splavs are located north of Brankov’s Bridge on the Novi Beograd side, and south of the Old Sava Bridge on the Old Belgrade side. Most don’t open until 11 PM or midnight and don’t really get going until 2 AM, so prepare for a late night! Belgrade is notorious for its crazy dusk-til-dawn nightlife. 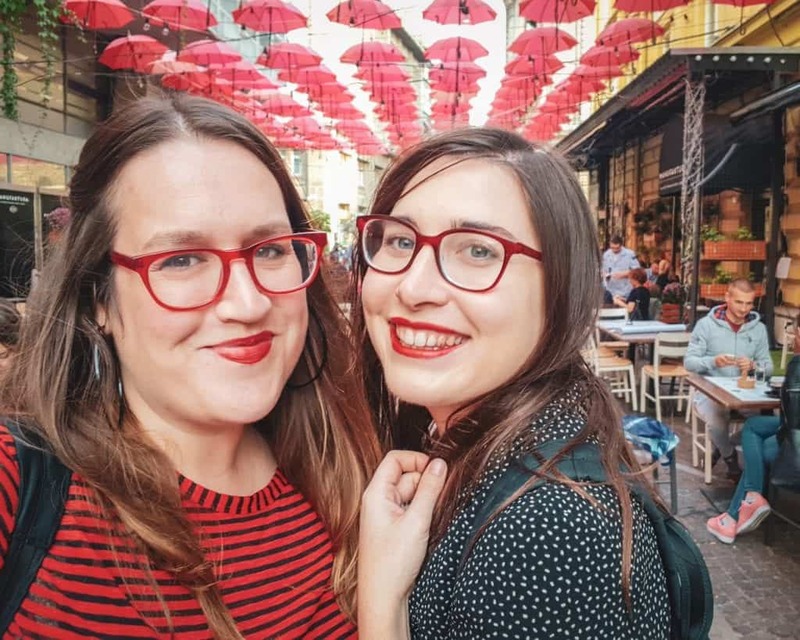 And it’s no lie – in fact, the one time I stayed out until past sunrise partying in my adult life was in fact in Belgrade on one of its splavs! Yes, I know, I’m lame – but even Belgrade pulled out my inner cool person, if only for a night. 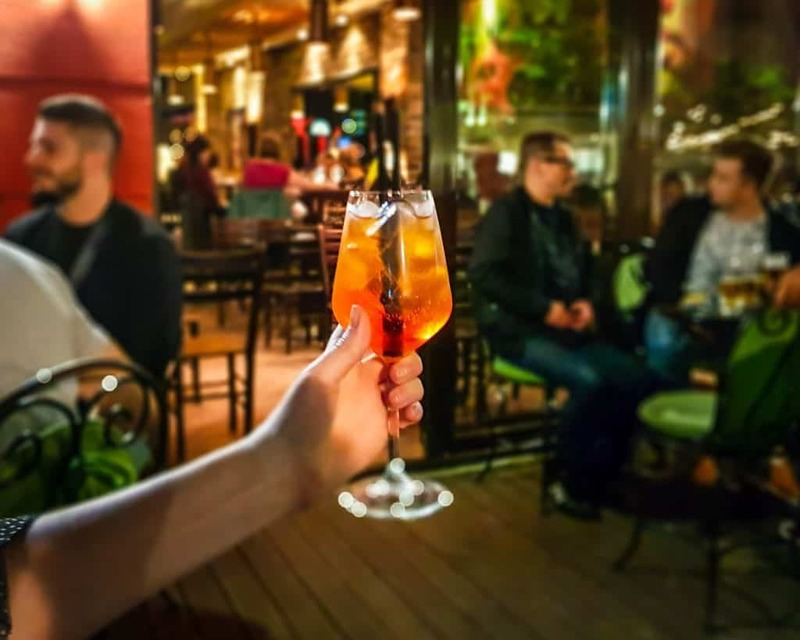 Great for solo travelers, groups of friends, and even couples who want to meet fellow travelers and get to see Belgrade nightlife firsthand, a pub crawl is a fantastic way to get an insider look at Belgrade nightlife. There are a few different crawls in Belgrade – we recommend this local beer crawl or this craft beer crawl. If you’re planning a trip to Serbia, make sure to travel with a valid travel insurance policy. If you’ll be spending time in the city or doing any outdoor activities like hiking or swimming, you need to be covered in case of an emergency. Travel insurance covers you in case of theft or an accident, which can save your trip if there’s an incident.